(CNN) -- No guts no glory, or so the saying goes. But perhaps the vanquished United States soccer team can rest in the knowledge that if the World Cup was decided on guts, it would surely be lifting the trophy in Brazil. For 120 minutes of Tuesday's ultimately unsuccessful last-16 clash with Belgium, each one of Jurgen Klinsmann's men left everything on the field in Salvador. From the second the Americans went 2-0 down in extra time thanks to goals from Kevin De Bruyne and Romelu Lukaku, the rearguard action started. Substitute Julian Green's goal offered the nation a lifeline and energized its fatigued players with a quarter of an hour to play. And you could almost hear the sigh of despair from New York to Nevada as late chances for Jermaine Jones and Clint Dempsey were agonizingly spurned. The final whistle signaled tumult at either end of the emotional spectrum as Belgium advanced to a quarterfinal with Argentina on Saturday and the U.S. departed. Beaten, yes, but not bowed. "It's hard for us to end up on the losing side after 120 minutes of giving absolutely everything," Klinsmann told reporters. "But this game had everything, it was a thriller. We had chances to equalize, but congratulations to Belgium. "I'm proud of the players not just for what they've done tonight, but what they've done throughout the tournament. They've made the country proud." 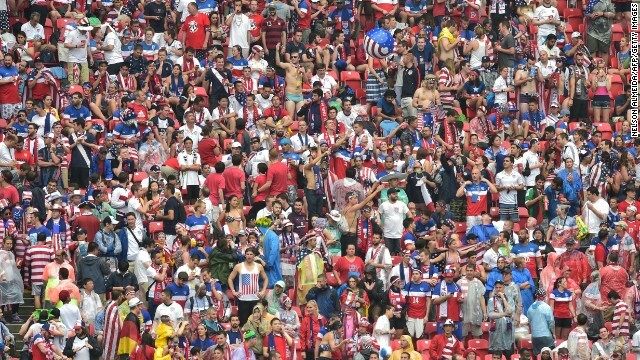 With every passing minute of its participation in the World Cup, the United States had drawn soccer a little closer to its heart. And though its harrowing exit will cut deep, if ever there was a football match to ignite one nation's passion for the beautiful game this was it. Buoyed by progress from a tricky group, if the U.S. thought Belgium might represent a simpler prospect than Germany it took less than a minute to dispel that notion. The Red Devils poured forward like the Red Arrows in the game's fledgling stages as a pass from Kevin De Bruyne, of German outfit VfL Wolfsburg, sent teenager Divock Origi scampering through on goal. His effort was powerfully struck but just like a succession of German players had found in their final group game, Tim Howard was in parsimonious mood, and blocked with his legs. Save for a clutch of enterprising moments in three successful group games, Belgium had failed to live up to its pre-tournament tag of dark horse. But though the Europeans bristled with intent during the opening exchanges, the United States would not be cowed and created its first openings after 20 minutes. 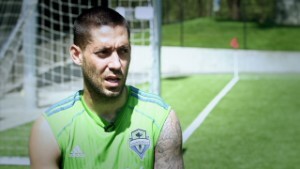 Dempsey narrowly failed to connect with a corner before a marauding run from Michael Bradley, son of former USMNT coach Bob, presented the Seattle Sounders star with a clear sight of goal. 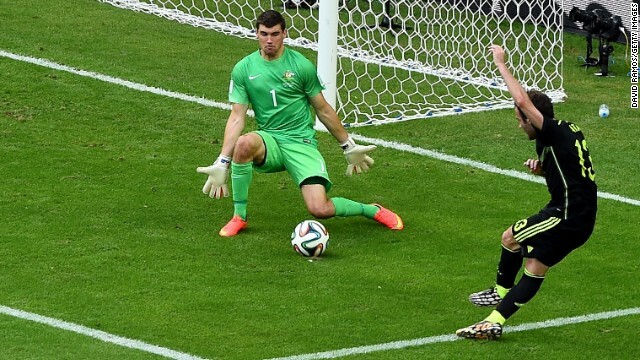 But just as Howard had in the opening minute, Belgium's goalkeeper Thibaut Courtois was equal to the task. Respite proved brief though, as Belgium resumed its front-foot role. Jan Vertonghen was twice involved as the Red Devils spurned a pair of chances in quick succession. First the defender, who plies his trade for Tottenham in the English Premier League, pinched the ball in midfield and fed De Bruyne but he dragged a shot wide. Then Vertonghen profited down the left channel but hesitated momentarily before pulling the ball across the face of goal, allowing DaMarcus Beasley to clear from inside his own six-yard box. The pattern continued after the interval, the USA adopting a more open style than in its previous encounter but at the same time struggling to counter the pace and dynamism offered by Belgium. 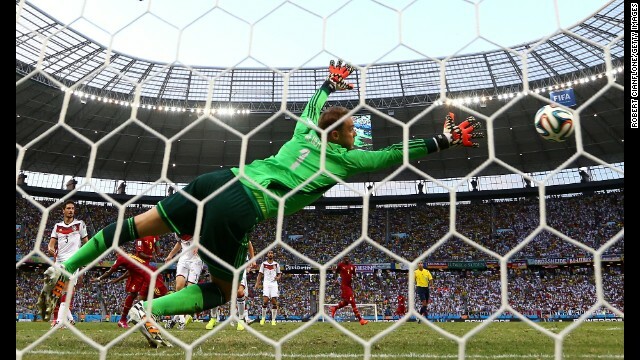 Germany's Mario Gotze scores the goal that would decide the World Cup final Sunday, July 13, in Rio de Janeiro. 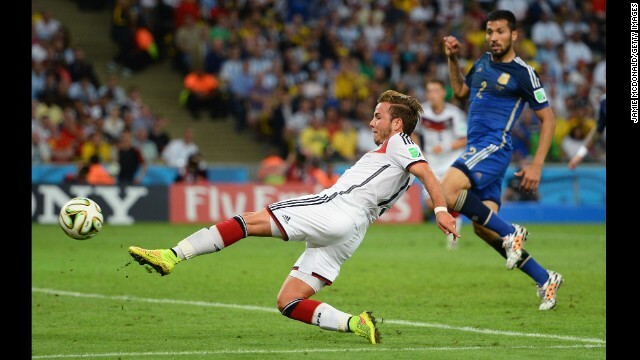 Gotze, a late substitute, scored the goal in extra time as Germany won 1-0. 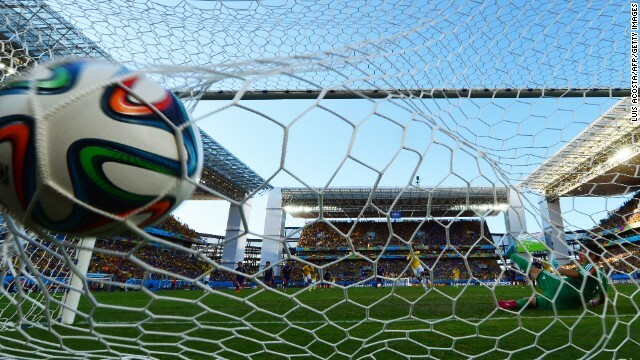 Click through the gallery to see all the goals scored in the World Cup. 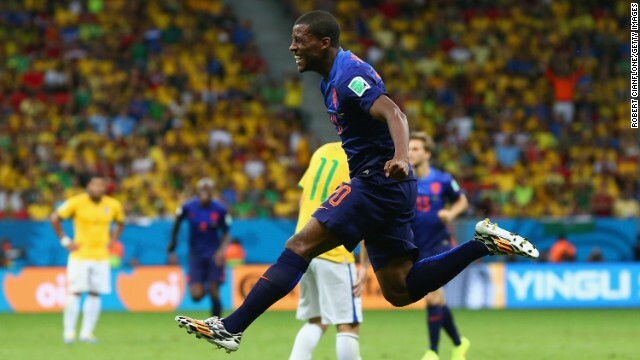 Georginio Wijnaldum of the Netherlands celebrates scoring his team's third goal during the third-place playoff match against Brazil on Saturday, July 12, in Brasilia, Brazil. 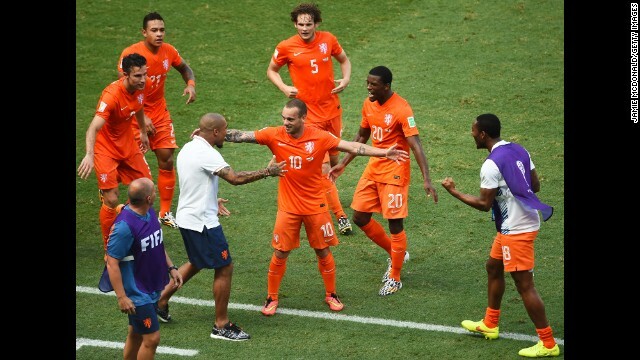 The Netherlands defeated Brazil 3-0. 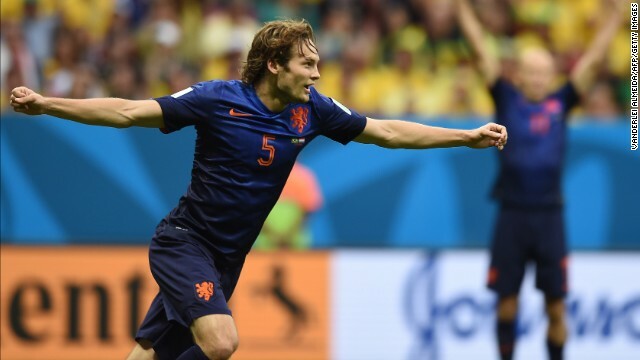 Netherlands defender Daley Blind celebrates after scoring a goal to make it 2-0. 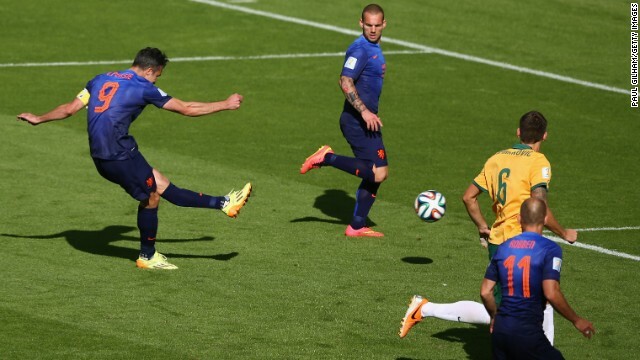 Robin van Persie of the Netherlands shoots and scores the first goal of the third-place match. Oscar of Brazil scores a late second-half goal against Germany during a World Cup semifinal match played Tuesday, July 8, in Belo Horizonte, Brazil. But it was no consolation for the home team, which was knocked out of the tournament by a stunning score of 7-1. Andre Schuerrle of Germany celebrates scoring his team's seventh goal. It was his second goal of the game. Schuerrle, right, pumps his fist after making the score 6-0. 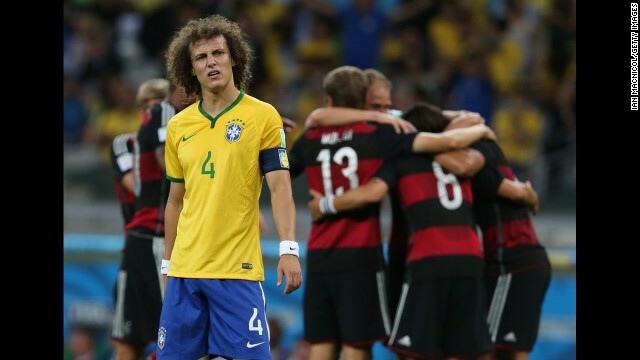 Brazil's David Luiz stands near a group of German players as they celebrate their fifth goal. Germany led 5-0 at halftime. 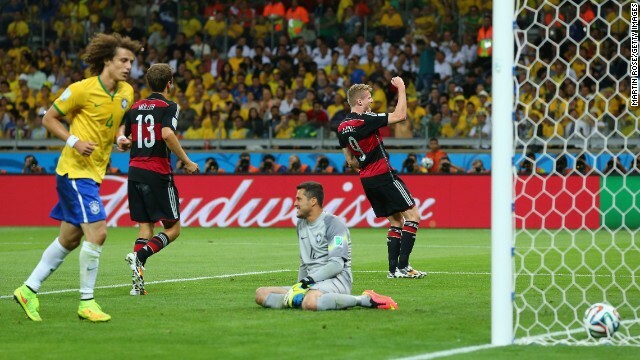 Germany's Toni Kroos, second from left, celebrates scoring his second goal of the game. It put his team up 4-0. Kroos is lifted in the air by teammate Sami Khedira after he scored to put Germany up 3-0. Germany's Miroslav Klose, second from left, scores his team's second goal. 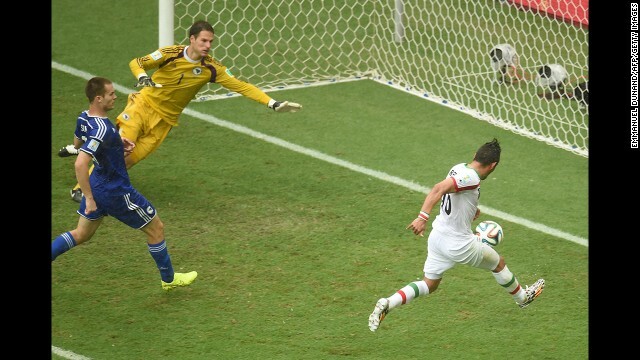 The goal also made Klose the all-time leading scorer in World Cup history. Benedikt Hoewedes of Germany celebrates after teammate Thomas Mueller, not pictured, scored the opening goal against Brazil. Gonzalo Higuain of Argentina, left, celebrates his goal against Belgium in a World Cup quarterfinal match Saturday, July 5, in Brasilia, Brazil. It was the only goal of the match. Colombia's James Rodriguez scores a second-half penalty against Brazil during a World Cup quarterfinal match Friday, July 4, in Fortaleza, Brazil. But Brazil held on to win 2-1 and advance to the semifinals. 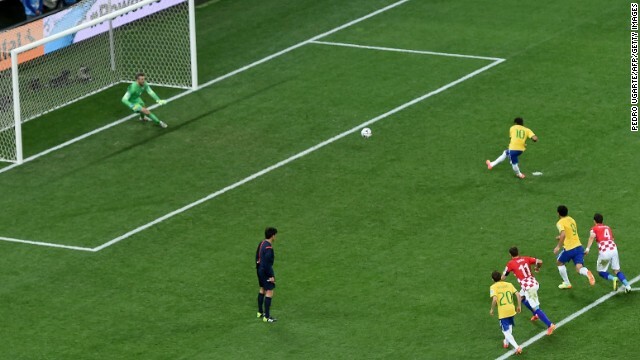 David Luiz gave Brazil a 2-0 lead with a stunning long-range free kick in the second half. Brazil's captain, Thiago Silva, redirects a corner kick into the net to give his team a 1-0 lead over Colombia early in the first half. 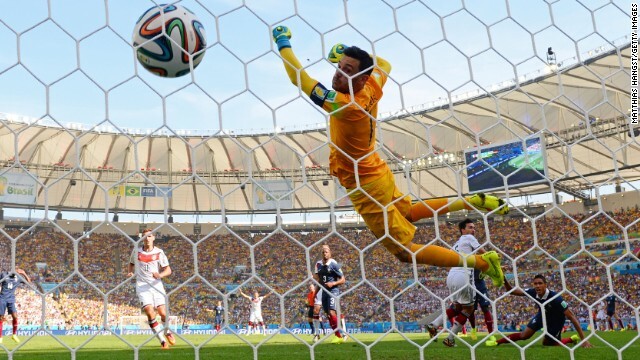 The ball flies by French goalkeeper Hugo Lloris after a header by Germany's Mats Hummels opened the scoring in their World Cup quarterfinal July 4 in Rio de Janeiro. 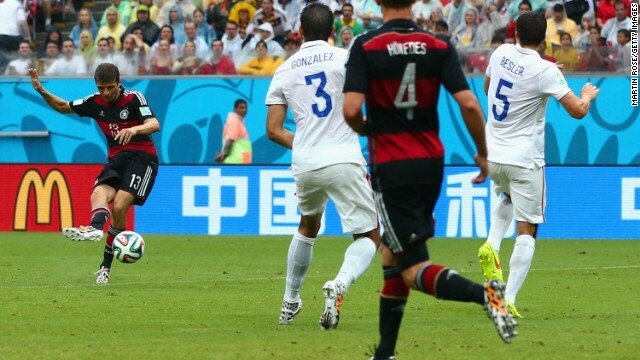 It was the only goal in the match as Germany won to advance to the semifinals. Julian Green of the United States scores a goal against Belgium during extra time of a World Cup round-of-16 match Tuesday, July 1, in Salvador, Brazil. 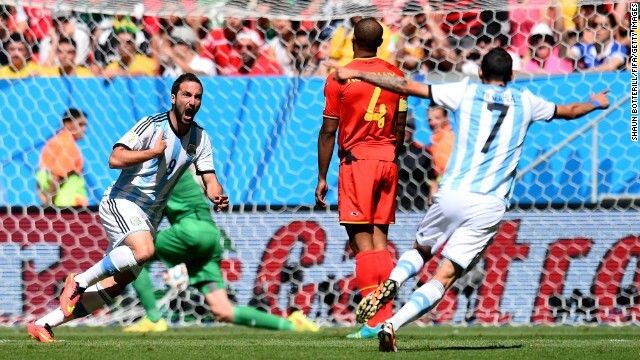 Belgium won the match 2-1, however, to advance to the quarterfinals of the soccer tournament. Belgian striker Romelu Lukaku scores his team's second goal in extra time. The game was scoreless after regulation. Belgian midfielder Kevin De Bruyne scores the first goal of the match. Argentina players Lionel Messi, left, and Angel Di Maria celebrate after Di Maria scored the winning goal in extra time to beat Switzerland 1-0 and advance to the World Cup quarterfinals. Abdelmoumene Djabou of Algeria shoots and scores his team's first goal in extra time during a World Cup round-of-16 match against Germany on Monday, June 30, in Porto Alegre, Brazil. 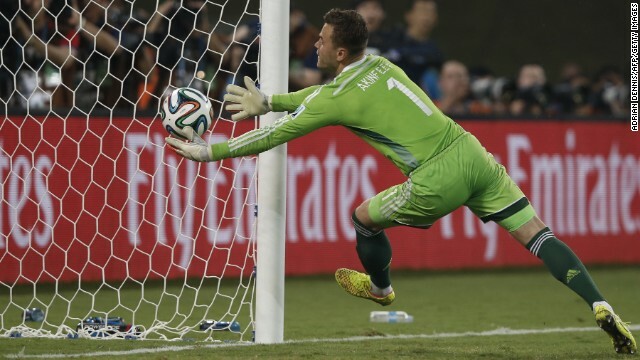 Despite the late goal, Germany still advanced to the quarterfinals with a 2-1 victory. 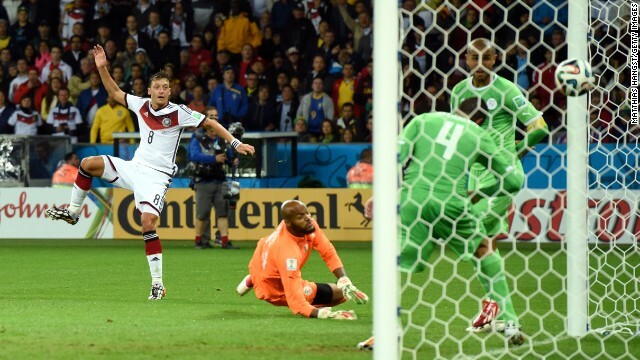 Mesut Oezil of Germany scores his team's second goal past Rais M'Bolhi of Algeria. 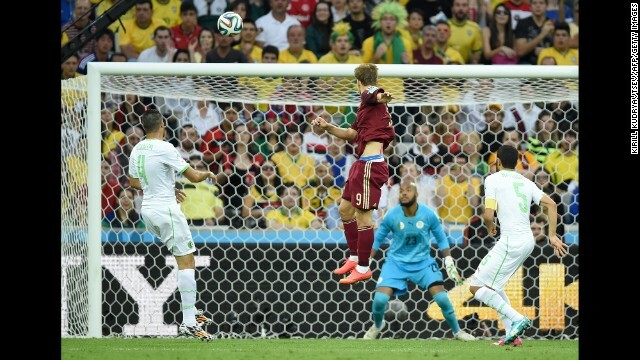 Andre Schuerrle, center, scores a backheel goal in extra time to give Germany a 1-0 lead over Algeria. The ball hits Nigerian defender Joseph Yobo, right, before going into his own net during a World Cup match against France on June 30, in Brasilia, Brazil. France advanced to the quarterfinals with a 2-0 victory. 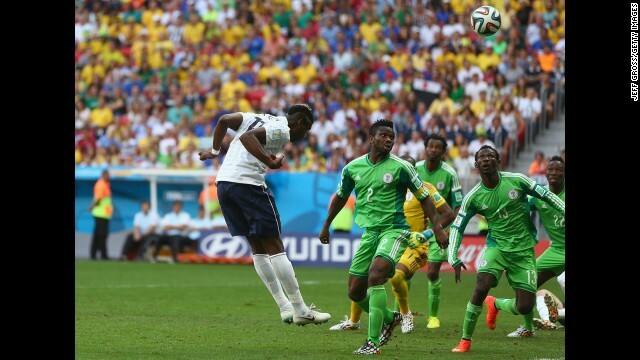 Paul Pogba of France heads in his team's first goal against Nigeria. Sokratis Papastathopoulos of Greece, left, shoots and scores late in the second half to tie Costa Rica during a game in Recife, Brazil, on Sunday, June 29. The elimination-round game ended with a final score of 1-1. 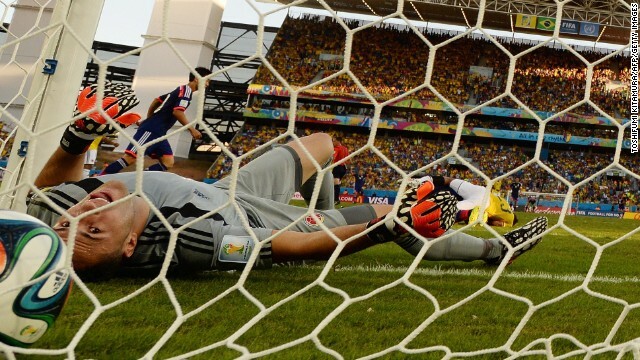 Costa Rica advanced by winning a penalty kick shootout. Bryan Ruiz of Costa Rica scores his team's goal against Greece. Klaas-Jan Huntelaar of the Netherlands shoots and scores his team's second goal on a stoppage-time penalty kick during a World Cup game against Mexico in Fortaleza, Brazil, on June 29. 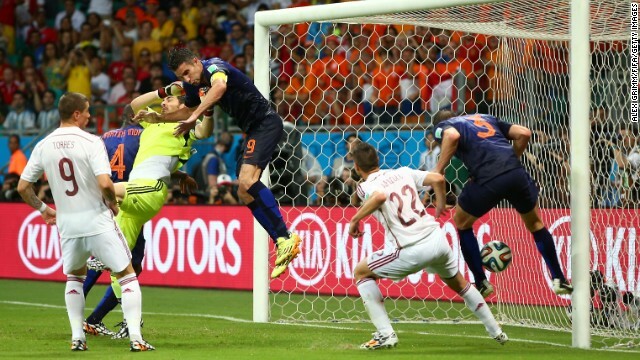 The Netherlands won 2-1 to advance to the quarterfinals. Wesley Sneijder of the Netherlands (No. 10) celebrates scoring his team's first goal against Mexico. Giovani dos Santos of Mexico celebrates scoring his team's goal against the Netherlands. James Rodriguez of Colombia, left, celebrates scoring his team's second goal against Uruguay in Rio de Janeiro on Saturday, June 28. Colombia won the game 2-0 to advance to the quarterfinals. Rodriguez had both goals. Rodriguez shoots and scores his team's first goal against Uruguay. 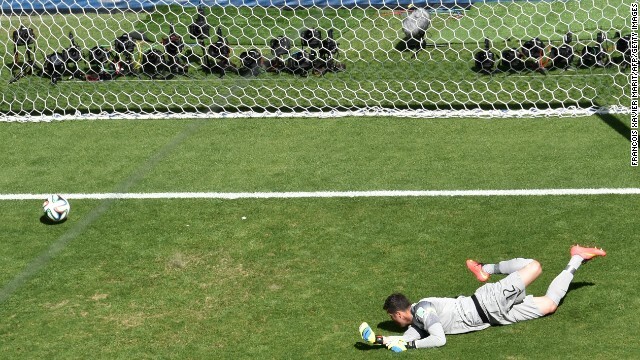 Brazil's goalkeeper, Julio Cesar, concedes a goal to Alexis Sanchez during a World Cup game against Chile in Belo Horizonte, Brazil, on June 28. The first game of the elimination round ended with a score of 1-1. 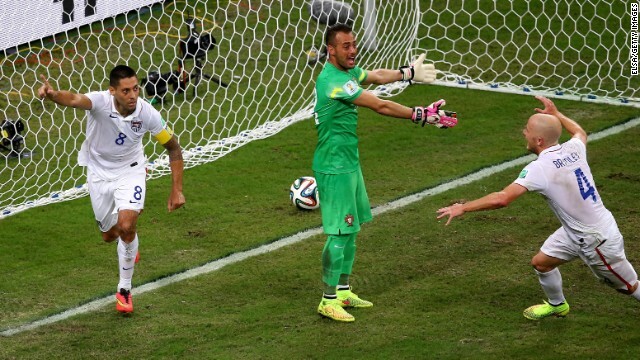 Brazil advanced to the quarterfinals by winning a penalty kick shootout. 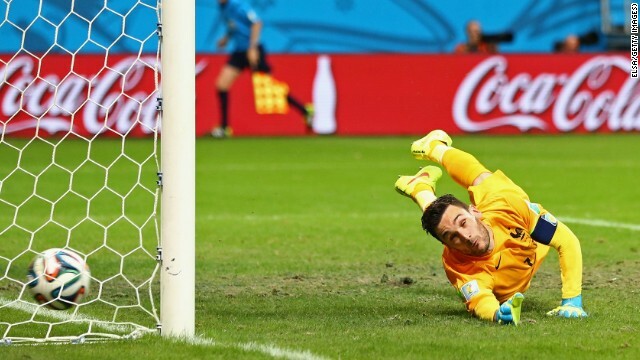 Chile's goalkeeper, Claudio Bravo, can't stop the ball from going in for a Brazil goal. 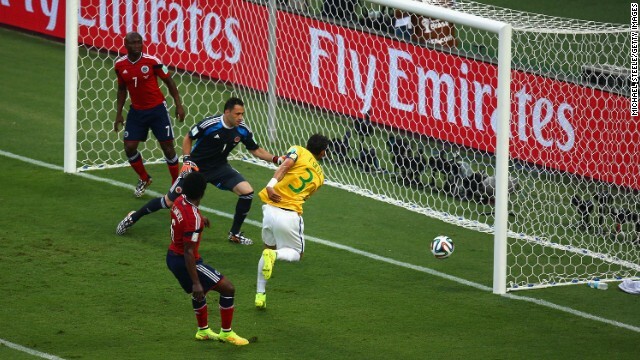 The goal was initially awarded to David Luiz, center, but it was later determined to be an own goal by Chile's Gonzalo Jara. Belgium defender Jan Vertonghen celebrates after scoring during a World Cup match against South Korea on Thursday, June 26, at the Corinthians Arena in Sao Paulo. 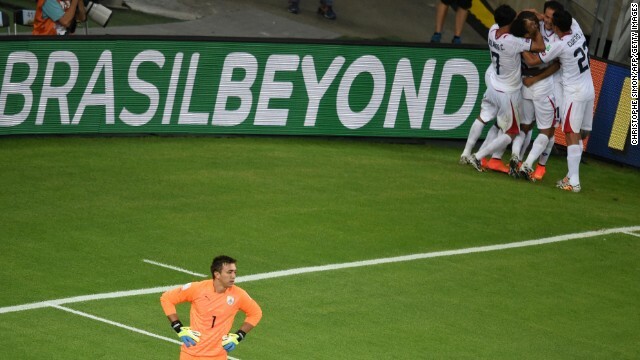 Algeria forward Islam Slimani, right, heads the ball to score a goal past Russia's goalkeeper Igor Akinfeev during a World Cup match at the Baixada Arena in Curitiba, Brazil. 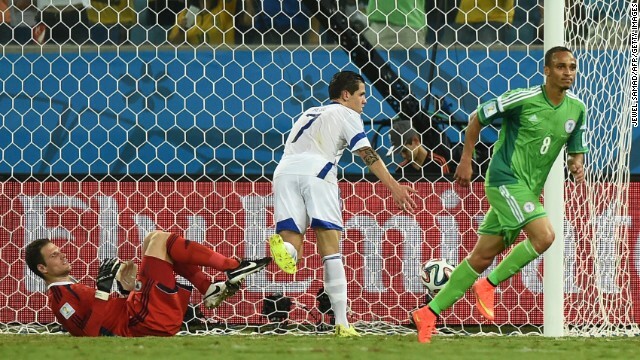 Russia forward Alexander Kokorin, center, scores his team's first goal past Algeria's goalkeeper Rais Mbohli, in blue. Portugal's forward and captain Cristiano Ronaldo scores during the match against Ghana on Thursday, June 26. Portugal won 2-1. Ghana's Asamoah Gyan heads the ball to score a goal against Portugal during a World Cup game in Brasilia, Brazil, on June 26. 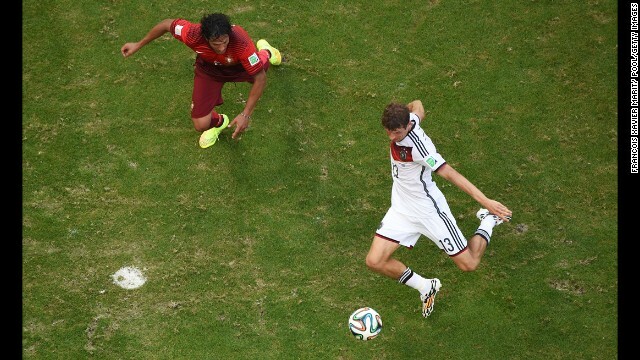 Thomas Mueller of Germany shoots and scores a goal against the United States in Recife, Brazil, on June 26. Germany won the match 1-0. 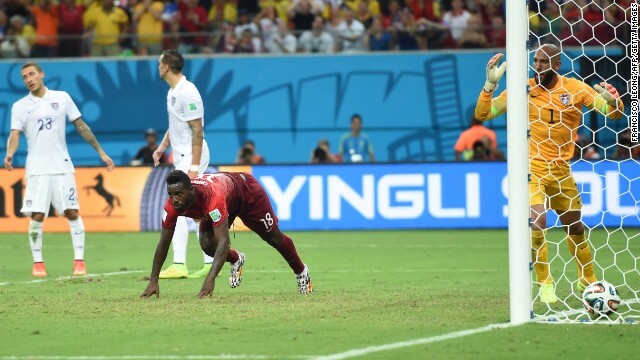 Ghana defender John Boye, center, hits the ball to score an own-goal as Portugal midfielder Joao Moutinho, right, watches on and Ghana goalkeeper Fatau Dauda tries to defend on June 26. Switzerland midfielder Xherdan Shaqiri, third from left, celebrates with forward Josip Drmic next to Honduras' goalkeeper Noel Valladares after scoring his team's third goal against Honduras in Manaus, Brazil, on Wednesday, June 25. Switzerland won 3-0. Shaqiri celebrates with forward Drmic, back, after scoring his team's second goal against Honduras. Shaqiri celebrates scoring his team's first goal against Honduras. Avdija Vrsajevic of Bosnia-Herzegovina shoots and scores his team's third goal past goalkeeper Alireza Haghighi of Iran during a match in Salvador, Brazil, on June 25. 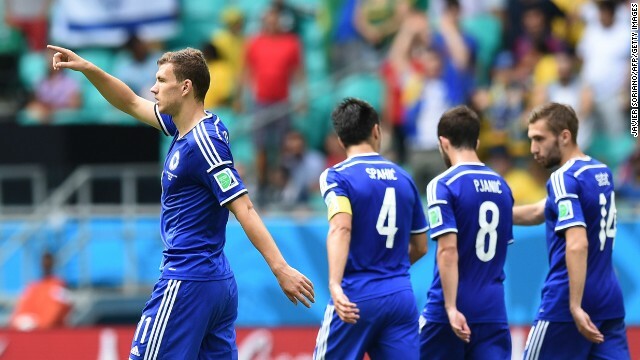 Bosnia-Herzegovina won 3-1. Iran forward Reza Ghoochannejhad, right, kicks to score his team's first goal past Bosnia-Herzegovina goalkeeper Asmir Begovic as Bosnia-Herzegovina defender Toni Sunjic runs during the match. 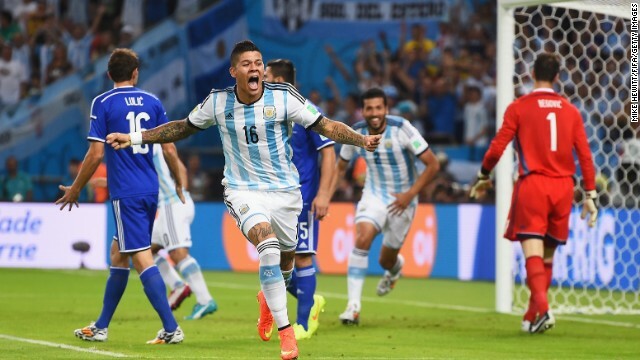 Argentina defender Marcos Rojo celebrates his team's third goal against Nigeria in Porto Alegre, Brazil, on June 25. Argentina won 3-2. 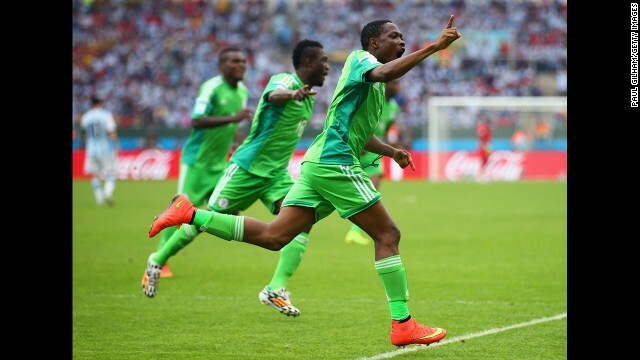 Nigeria forward Ahmed Musa celebrates scoring his team's second goal against Argentina. 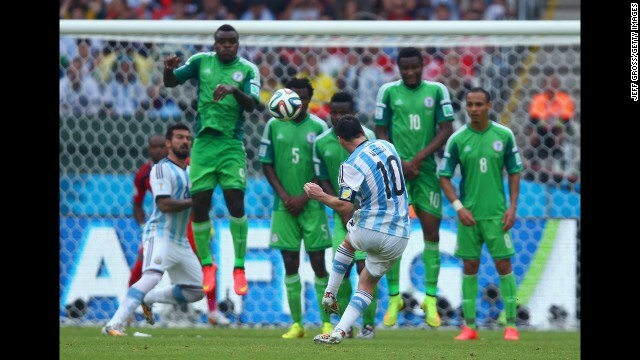 Argentina forward Lionel Messi scores his team's second goal against Nigeria. Bosnia-Herzegovina forward Edin Dzeko, left, celebrates scoring his team's first goal against Iran. 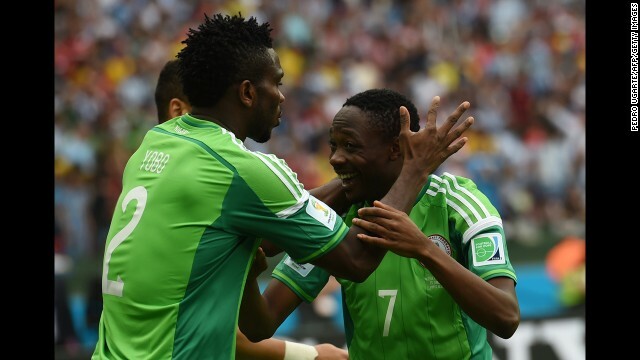 Musa, right, celebrates his goal with Nigeria defender Joseph Yobo during a match against Argentina. 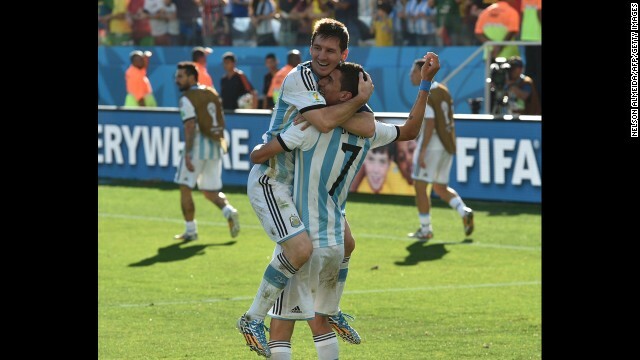 Messi, left, celebrates with his teammate Angel Di Maria, after scoring his team's first goal against Nigeria. 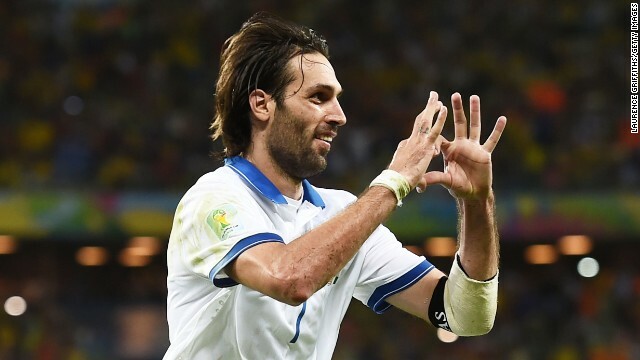 Giorgos Samaras of Greece celebrates scoring his team's second goal on a penalty kick against the Ivory Coast on Tuesday, June 24, in Fortaleza, Brazil. Greece won 2-1. 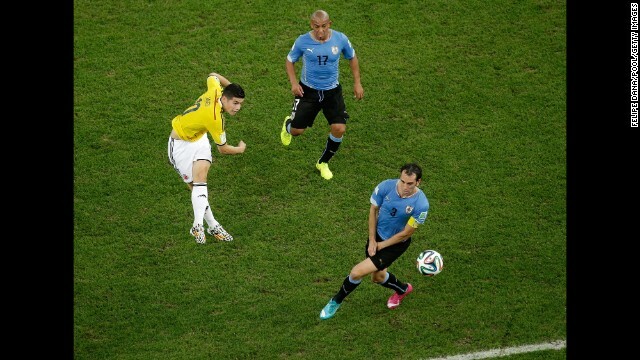 James Rodriguez of Colombia shoots and scores his team's fourth goal against Japan on June 24 in Cuiaba, Brazil. Colombia won 4-1. Jackson Martinez of Colombia, right, celebrates with his teammate Rodriguez after scoring his team's third goal against Japan. 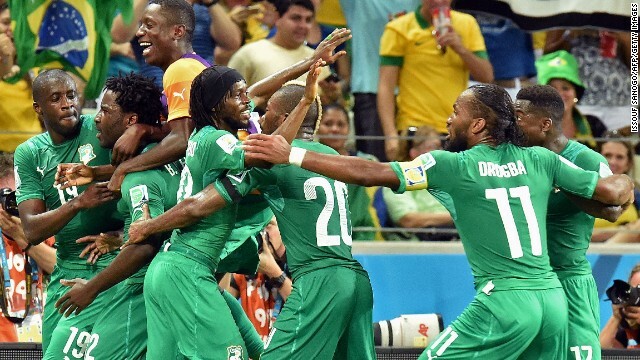 Ivory Coast's Wilfried Bony, second from left, celebrates with teammates after scoring a goal against Greece. 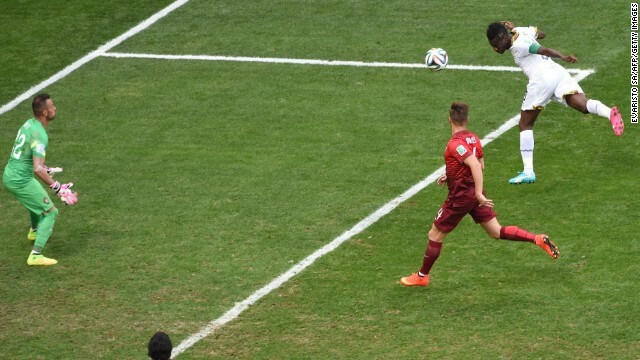 Jackson Martinez of Colombia shoots and scores his team's second goal against Japan. 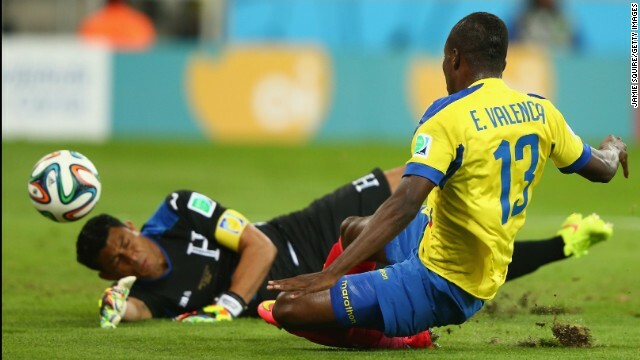 Colombia's goalkeeper David Ospina lies on the ground after Japan's Shinji Okazaki (not pictured) scored his team's first goal. Andreas Samaris of Greece scores against the Ivory Coast. 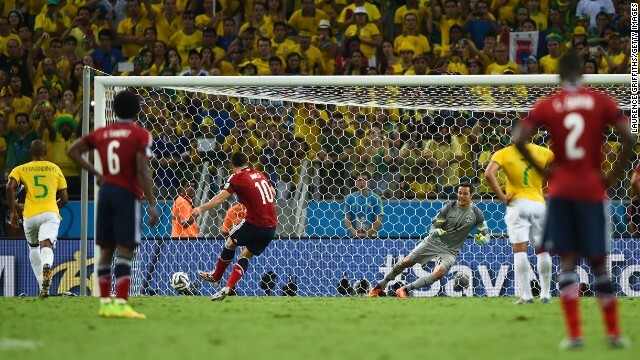 Colombia's Juan Guillermo Cuadrado scores a penalty during the match against Japan. 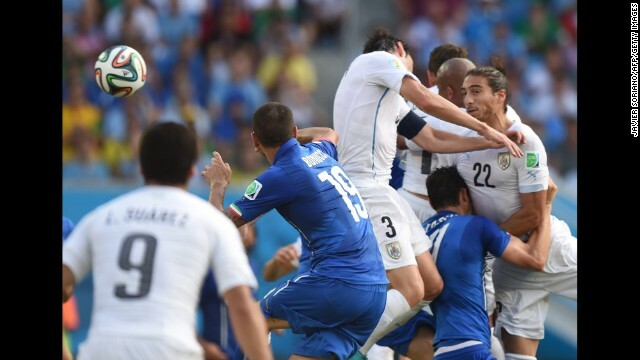 Uruguay's Diego Godin, second right, scores against Italy on June 24 in Natal, Brazil. Uruguay won 1-0. Goalkeeper Guillermo Ochoa of Mexico fails to stop Croatian midfielder Ivan Perisic from scoring on Monday, June 23, in Recife, Brazil. Mexico won 3-1. Fernandinho of Brazil, right, celebrates with his teammate Ramires after scoring his team's fourth and final goal against Cameroon on June 23 in Brasilia. Brazil won 4-1. 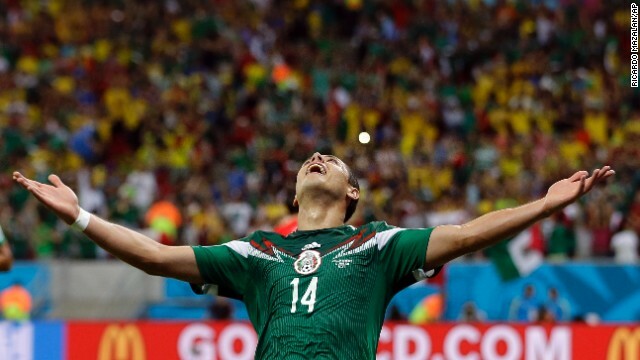 Mexico's Javier Hernandez celebrates after scoring his team's third goal against Croatia. 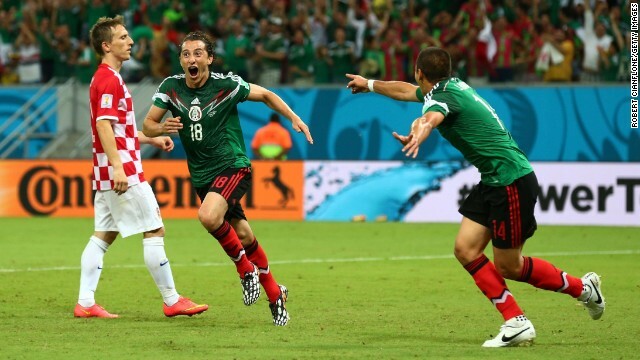 Andres Guardado of Mexico, center, celebrates after scoring the second goal against Croatia. 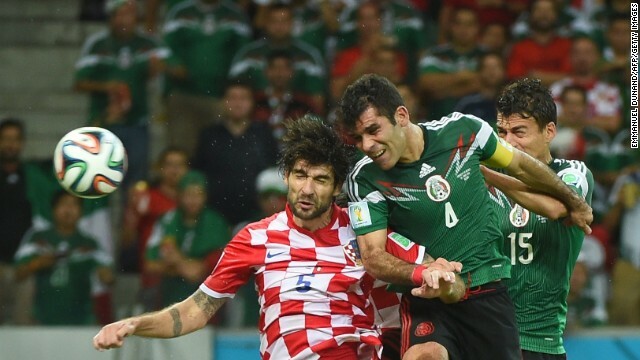 Mexico's Rafael Marquez, center, heads the ball to score his team's first goal against Croatia. Fred of Brazil scores his team's third goal on a header past Charles Itandje of Cameroon. Brazil forward Neymar, left, celebrates with his teammate Dani Alves after scoring Brazil's second goal against Cameroon. 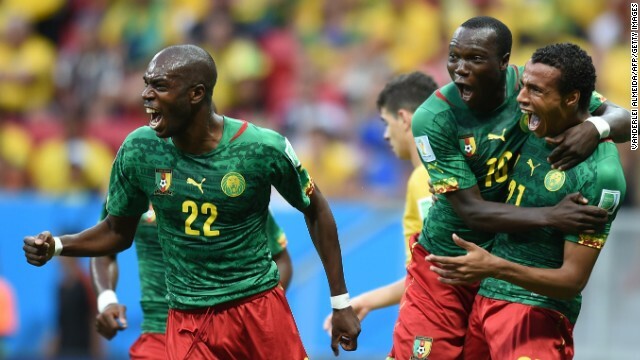 Cameroon midfielder Joel Matip, right, celebrates with Allan Nyom and Vincent Aboubakar after scoring a goal against Brazil. Brazil forward Neymar, right, scores Brazil's first goal past Cameroon goalkeeper Charles Itandje. Memphis Depay of the Netherlands scores his team's second goal past Chile's goalkeeper Claudio Bravo in Sao Paulo on June 23. Netherlands won 2-0. Juan Mata scores the third goal for Spain past Mathew Ryan of Australia at Arena da Baixada in Curitiba, Brazil, on June 23. Spain defeated Australia 3-0, but neither team will advance to the next round. Netherlands midfielder Leroy Fer celebrates scoring the team's first goal against Chile. 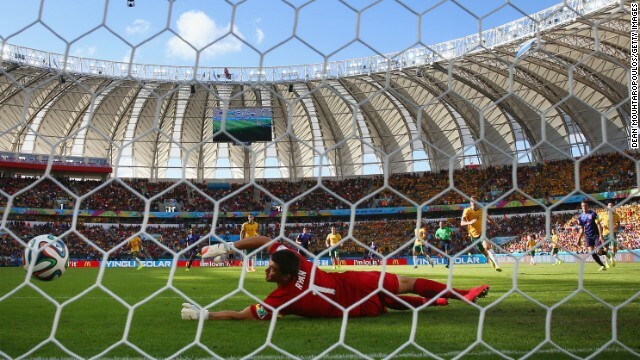 Spain's Fernando Torres scores his team's second goal past Australian Mathew Ryan. David Villa of Spain scores his team's first goal past Mathew Ryan of Australia. Portugal forward Silvestre Varela gets up after scoring his team's dramatic second goal in the last moments against the United States at Arena Amazonia in Manaus, Brazil, on Sunday, June 22. The final result was a 2-2 draw. 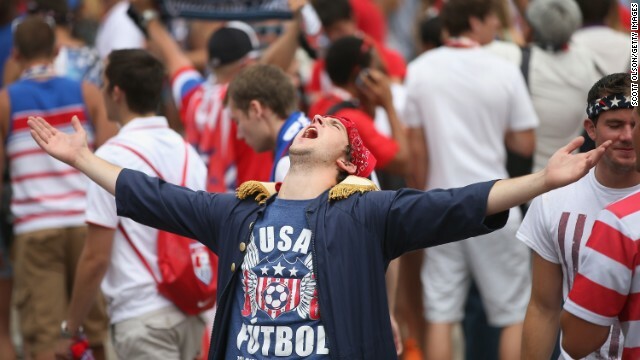 Clint Dempsey, left, of the United States celebrates scoring his team's second and go-ahead goal against Portugal. 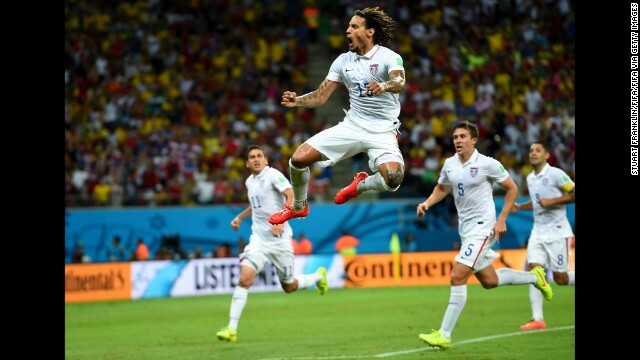 Jermaine Jones of the United States celebrates scoring his team's first goal in the second half against Portugal. Portugal's Nani, center, celebrates scoring a goal against the United States. He scored on a cross about 6 yards out from the goal. South Korean forward Koo Ja-cheol scores his team's second goal against Algeria at the Beira-Rio Stadium in Porto Alegre, Brazil, on June 22. Algeria won 4-2. 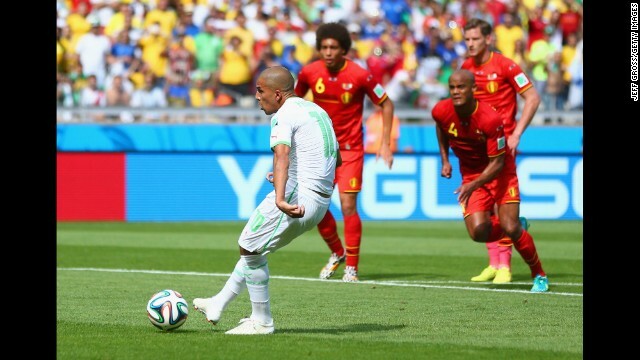 Yacine Brahimi, second left, scores Algeria's fourth goal against South Korea. Son Heung-min of South Korea scores his team's first goal past Madjid Bougherra of Algeria. Algerian forward Abdelmoumene Djabou celebrates scoring his team's third goal against South Korea. 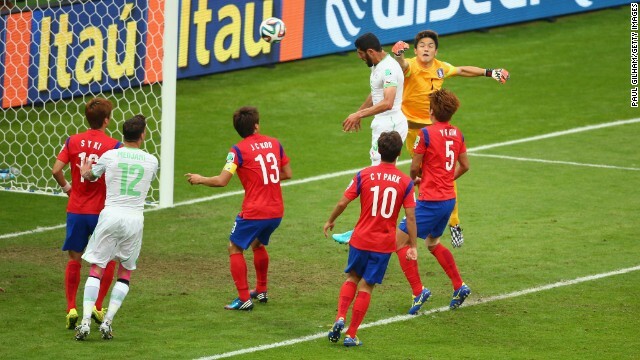 Algeria's Rafik Halliche scores the second goal against South Korea on a header. 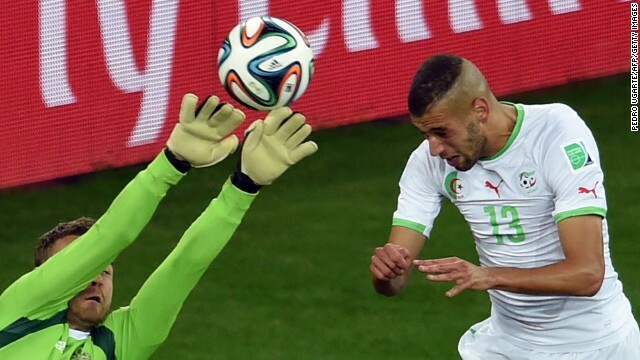 Islam Slimani of Algeria scores the first goal against South Korea. Belgium's forward Divock Origi, center, celebrates after scoring against Russia in Rio de Janeiro on June 22. Belgium won 1-0. Nigeria forward Peter Odemwingie, right, shoots past Bosnia-Herzegovina goalkeeper Asmir Begovic, left, on Saturday, June 21, in Cuiaba, Brazil. Nigeria won 1-0. 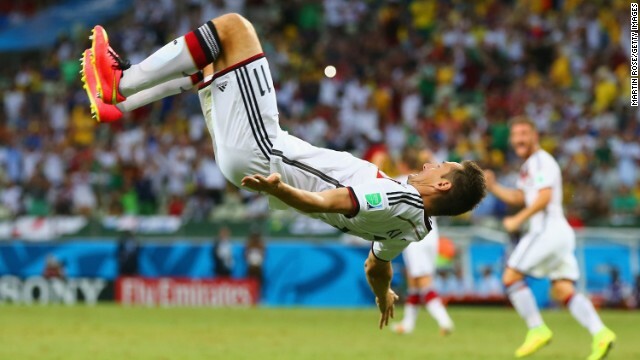 Germany substitute Miroslav Klose does a flip to celebrate after equaling the World Cup record of 15 goals overall, giving his team a 2-2 draw with Ghana on June 21 in Fortaleza, Brazil. 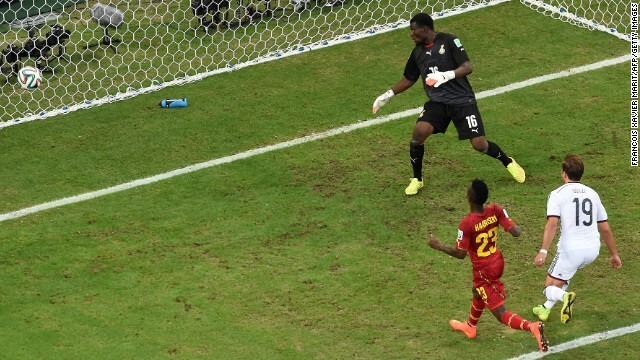 Asamoah Gyan of Ghana puts his team 2-1 head against Germany. 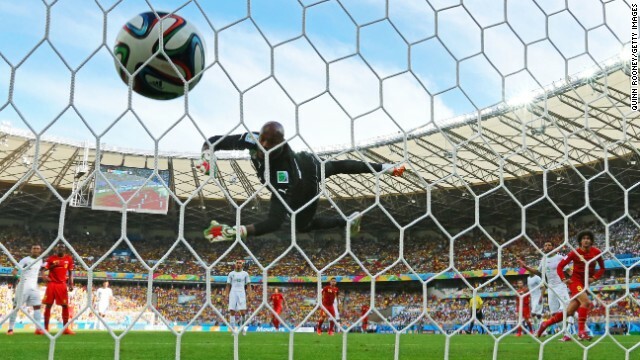 Andre Ayew scores Ghana's equalizer with a header past Germany goalkeeper Manuel Neuer. 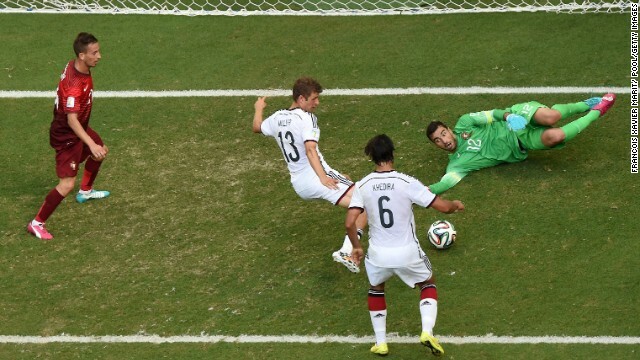 Germany midfielder Mario Gotze, right, scores the team's first goal against Ghana. Argentina forward and captain Lionel Messi celebrates after scoring the only goal in Argentina's World Cup victory over Iran on June 21 in Belo Horizonte, Brazil. 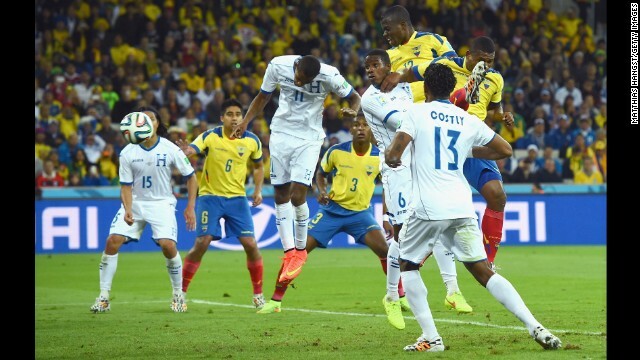 Enner Valencia of Ecuador scores his team's second goal on a header against Jerry Bengtson and Juan Carlos Garcia of Honduras on Friday, June 20, in Curitiba, Brazil. 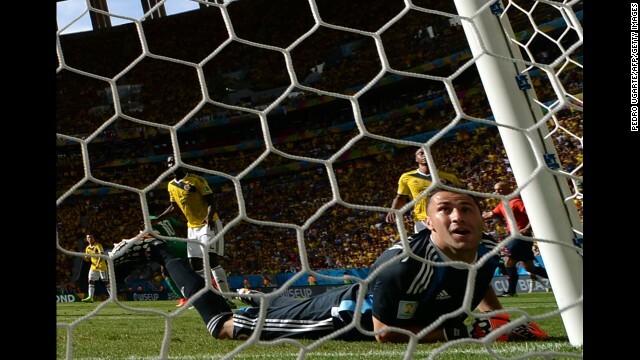 The goal brought the score to 2-1, Ecuador. 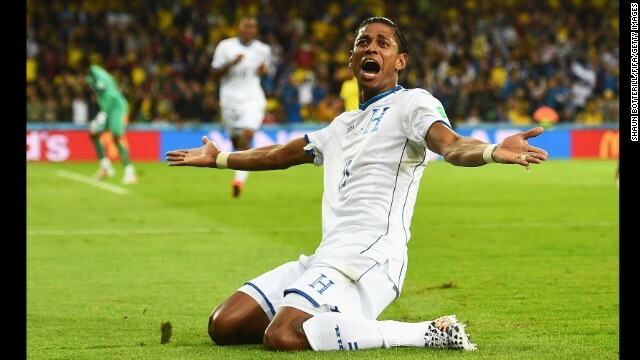 Carlo Costly of Honduras celebrates scoring his team's first goal, tying the score 1-1. 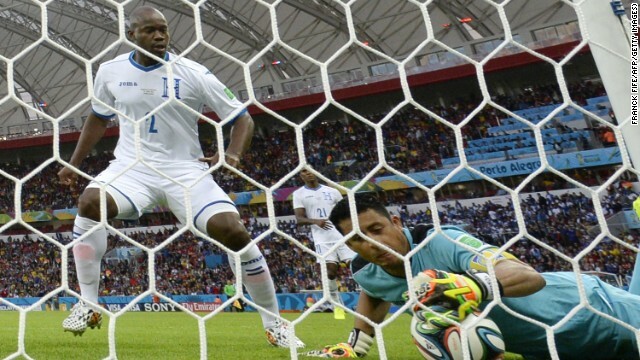 Enner Valencia of Ecuador scores the first goal of the game past Noel Valladares of Honduras. Switzerland midfielder Granit Xhaka scores on a volley in the second half against France on June 20. But France were well ahead by that point, winning 5-2 in Salvador, Brazil. 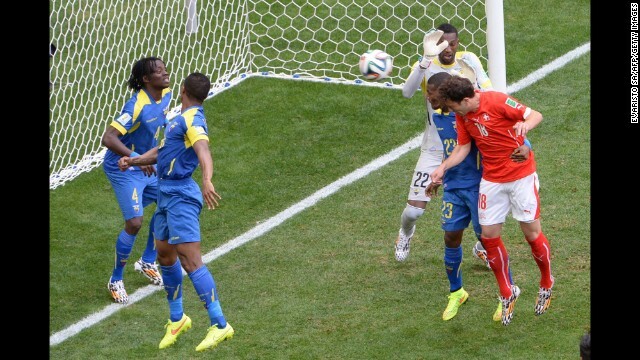 French goalkeeper Hugo Lloris can't get to a free kick from Switzerland's Blerim Dzemaili in the second half. France led 5-0 to that point. 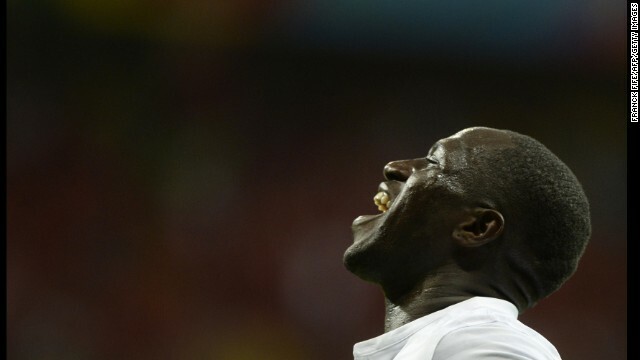 French midfielder Moussa Sissoko celebrates scoring his team's fifth goal. 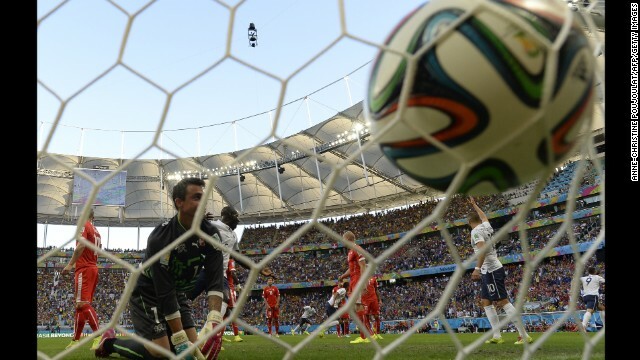 Karim Benzema slips the ball past Swiss goalkeeper Diego Benaglio for France's fourth goal. 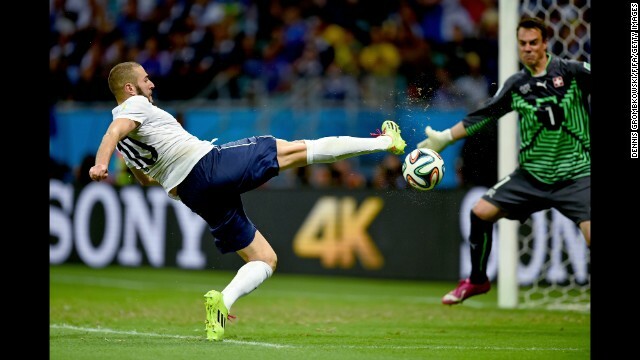 It was Benzema's third goal of the tournament. 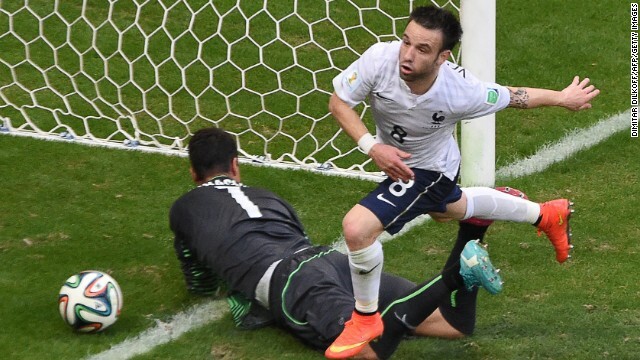 France's Mathieu Valbuena runs past Benaglio after giving his team a 3-0 lead in the first half. 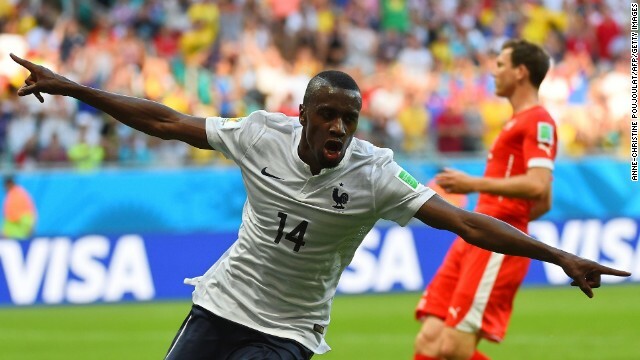 Blaise Matuidi celebrates his first-half goal, which gave France a 2-0 lead. 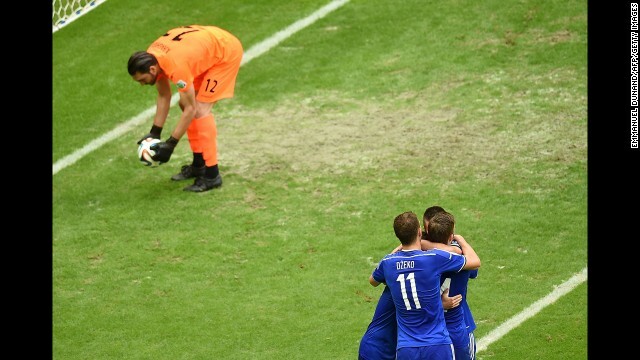 Benaglio kneels near the net after French forward Olivier Giroud, far right, headed in a goal to open the scoring. Costa Rican forward Bryan Ruiz heads the ball past Italian goalkeeper Gianluigi Buffon during the first half of a World Cup match Friday, June 20, in Recife, Brazil. Costa Rica held on to win 1-0 and clinch a spot in the next round of the tournament. Uruguayan forward Luis Suarez drills a shot to score a late second-half goal and defeat England 2-1 in a World Cup match Thursday, June 19, in Sao Paulo, Brazil. 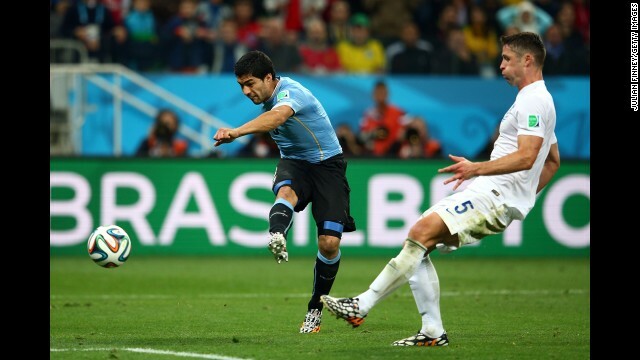 Suarez had both of Uruguay's goals. 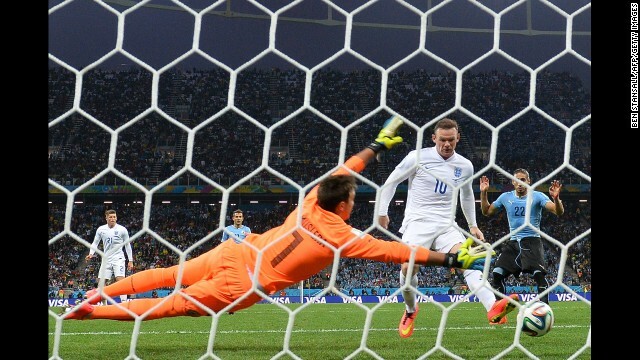 England forward Wayne Rooney taps the ball past Uruguay goalkeeper Fernando Muslera to tie the match at 1-1. It was Rooney's first World Cup goal in his career. 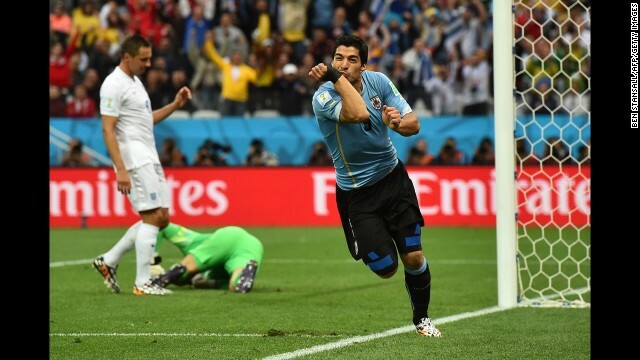 Suarez celebrates after steering a header past English goalkeeper Joe Hart in the first half. 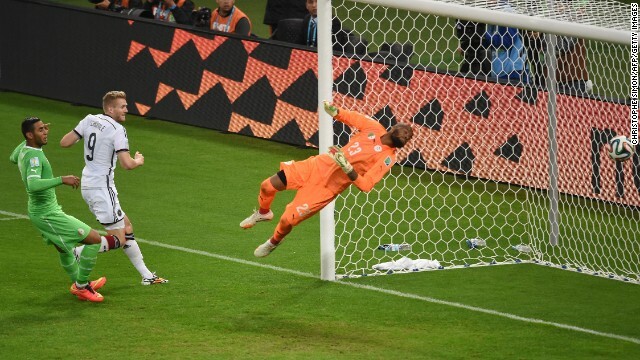 Colombian goalkeeper David Ospina fails to stop a second-half shot by Ivory Coast forward Gervinho during a World Cup match Thursday, June 19, in Brasilia, Brazil. Colombia won the match 2-1. Colombian forward Juan Fernando Quintero celebrates after his goal gave his team a 2-0 lead. 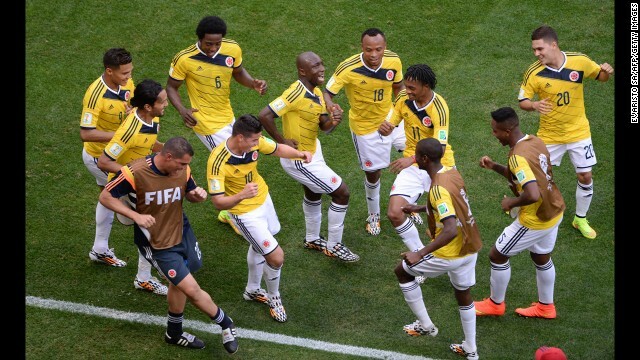 Colombia players dance after the first goal of the game, which was scored by James Rodriguez (No. 10) on a header. Mario Mandzukic of Croatia scores his second goal past Charles Itandje of Cameroon during a World Cup match Wednesday, June 18, in Manaus, Brazil. 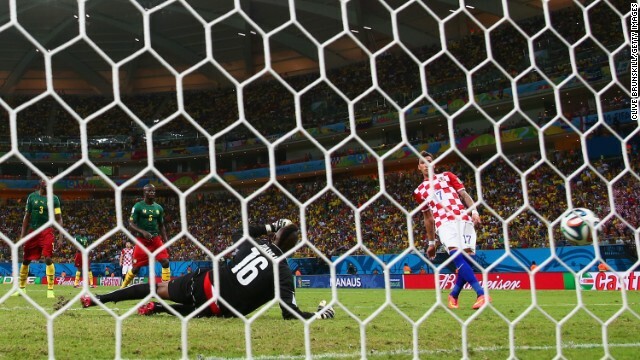 Croatia won 4-0, eliminating Cameroon from World Cup contention. Mandzukic, center, celebrates scoring Croatia's third goal with his teammates Dejan Lovren, left, and Vedran Corluka. Croatian midfielder Ivan Perisic shoots past Itandje. Croatian forward Ivica Olic, center, celebrates after scoring against the team's opening goal against Cameroon. Chilean players celebrate together after midfielder Charles Aranguiz gave them a 2-0 lead against Spain. 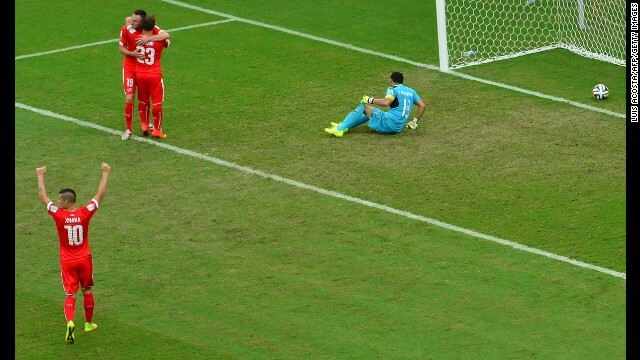 Chile won the match by that score, eliminating the defending world champions from the soccer tournament. Eduardo Vargas, right, scores Chile's first goal, firing past Spanish goalkeeper Iker Casillas. 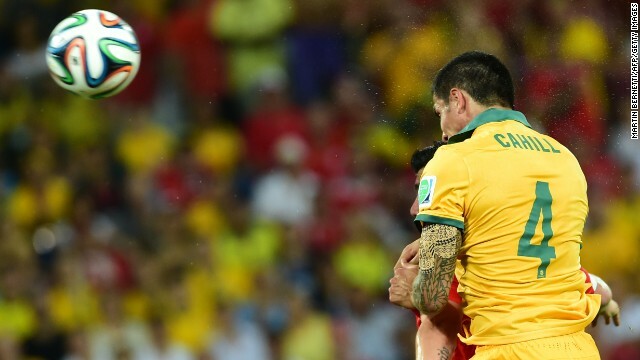 Australian goalkeeper Mathew Ryan can't reach a shot by Memphis Depay on June 18. Depay's second-half goal gave the Netherlands a 3-2 victory in Porto Alegre, Brazil. Robin Van Persie of the Netherlands ties the game at 2-2 with a close-range shot in the second half. 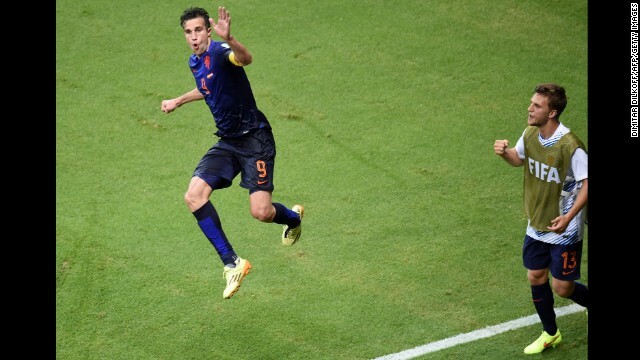 It was Van Persie's third goal of the tournament. 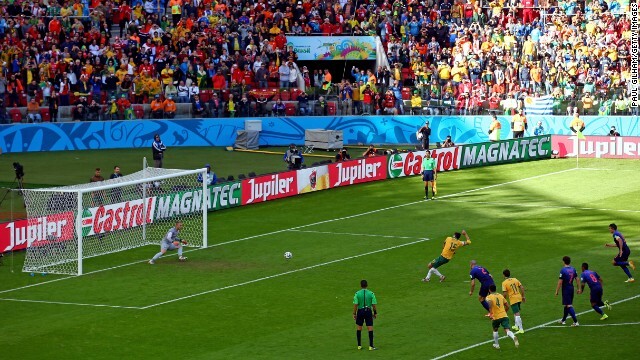 A penalty kick from Australian captain Mile Jedinak gives the "Socceroos" a 2-1 lead over the Netherlands. 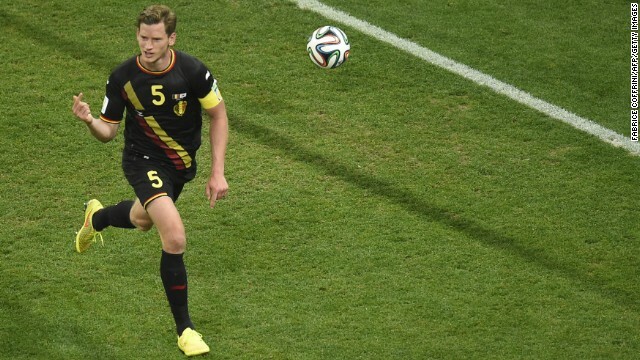 The penalty was awarded after a handball was called against Dutch defender Daryl Janmaat. 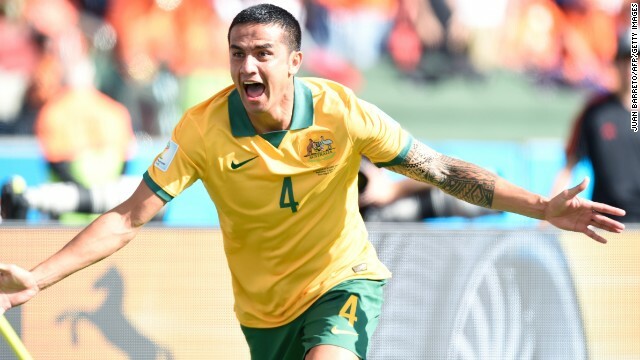 Australian forward Tim Cahill celebrates after scoring a goal against the Netherlands. His impressive volley tied the match at 1-1. Arjen Robben of the Netherlands opens the scoring. It was his third goal of the tournament. Russian forward Alexander Kerzhakov, second from right, scores the final goal of a 1-1 draw against South Korea on Tuesday, June 17, in Cuiaba, Brazil. Russian goalkeeper Igor Akinfeev fails to stop South Korea from scoring the first goal of the game late in the second half. 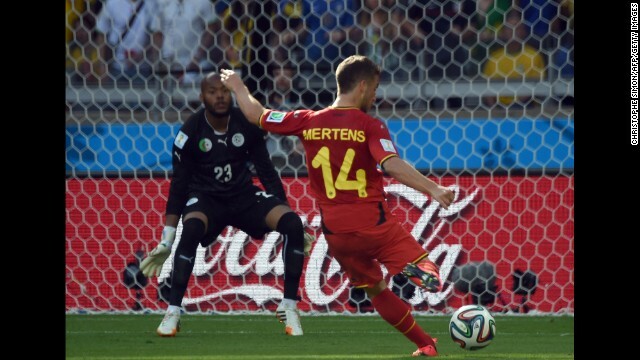 Belgium's Dries Mertens shoots what would turn out to be the winning goal during a World Cup match against Algeria on June 17 in Belo Horizonte, Brazil. Belgium won the match 2-1 after trailing 1-0 at halftime. 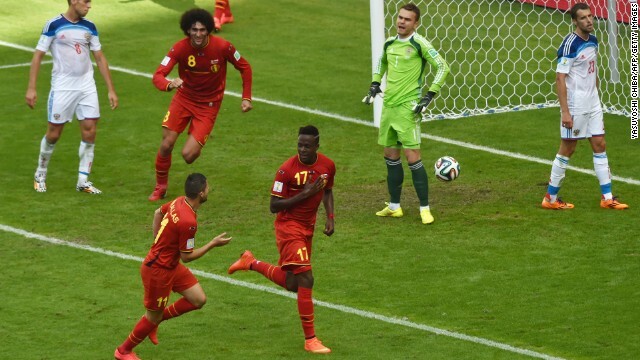 Marouane Fellaini of Belgium, far right, tied the game with a powerful header in the second half. Sofiane Feghouli scores on a penalty kick to give Algeria a 1-0 lead. 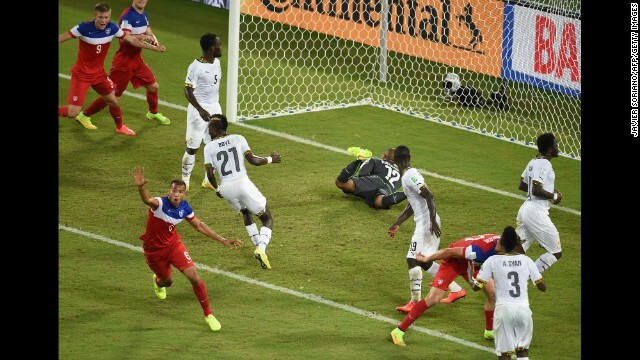 American defender John Brooks, bottom left, celebrates after scoring the winning goal against Ghana during a World Cup match Monday, June 16, in Natal, Brazil. 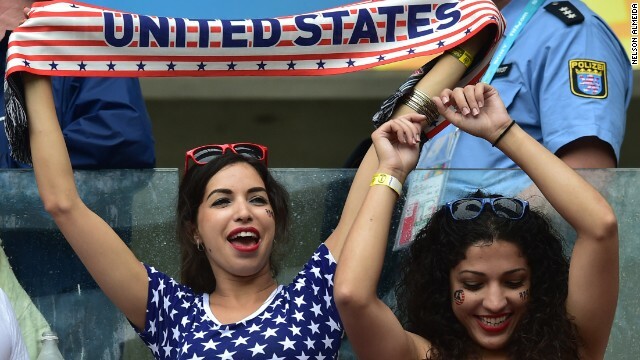 The United States won 2-1 thanks to Brooks' header in the 86th minute. 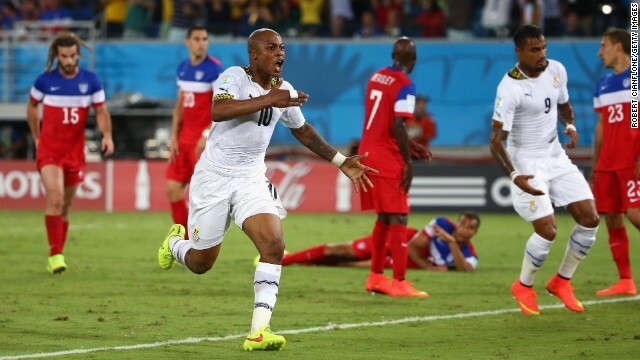 Andre Ayew of Ghana celebrates after scoring a second-half goal to tie the United States. 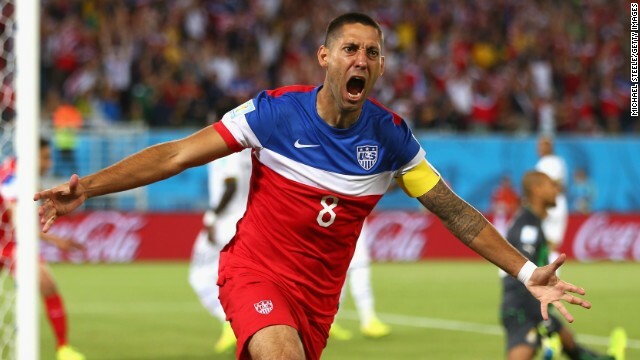 Clint Dempsey of the United States reacts after scoring in the first minute of the Ghana match. Germany's Thomas Mueller scores his third goal of the game -- and the fourth for his team -- en route to a 4-0 pasting of Portugal on June 16. 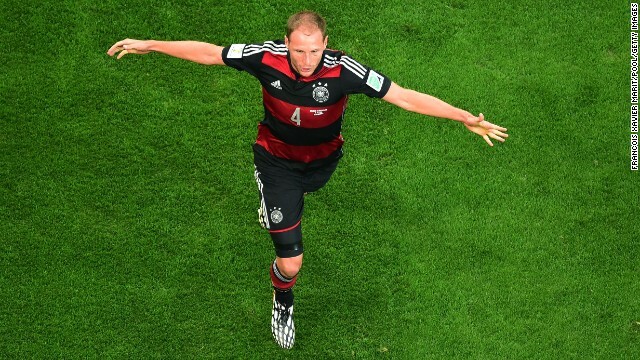 Mueller's second goal put Germany up 3-0 right before halftime in Salvador, Brazil. 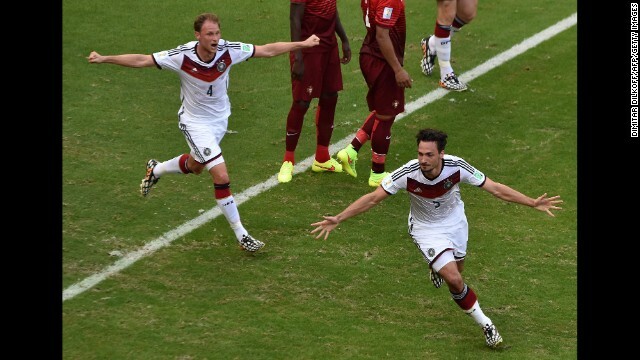 Mats Hummels, right, celebrates after heading in a corner kick to put Germany up 2-0. Mueller opens the scoring on a penalty kick, slotting the ball past Rui Patricio of Portugal. The penalty was awarded after Mario Goetze was brought down in the box. Substitute Vedad Ibisevic shoots past Argentina goalkeeper Sergio Romero to score Bosnia-Herzegovina's historic first World Cup goal Sunday, June 15, at the Maracana Stadium in Rio de Janeiro. 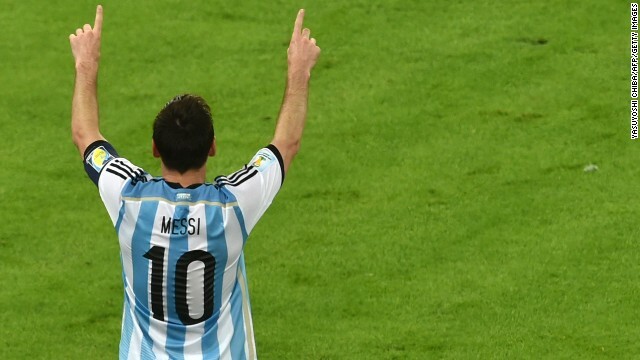 But Argentina won the match 2-1. 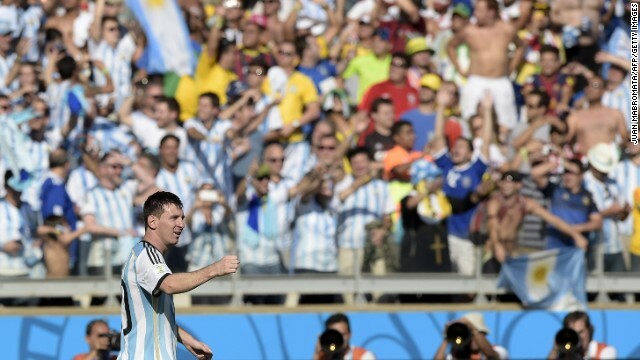 Argentina's captain, Lionel Messi, celebrates scoring his team's second goal against Bosnia-Herzegovina. Argentina's Marcos Rojo celebrates after Sead Kolasinac of Bosnia-Herzegovina scored an own goal in the early minutes of the game. Karim Benzema, left, celebrates with teammate Blaise Matuidi after scoring France's third goal against Honduras on June 15. It was his second goal of the match, which France won 3-0 in Porto Alegre, Brazil. Honduras goalkeeper Noel Valladares, right, scores an unfortunate own goal after a shot by Benzema rebounded off the post. 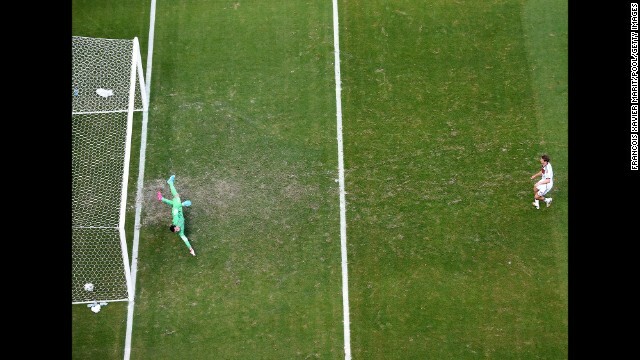 It was confirmed by FIFA's new goal-line technology. 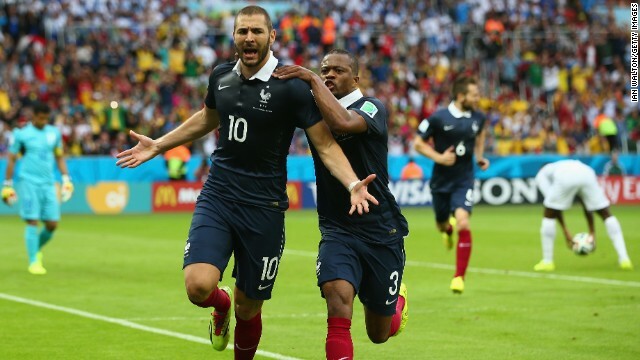 Benzema celebrates with Patrice Evra after scoring France's first goal against Honduras. Substitute Haris Seferovic scores Switzerland's winning goal against Ecuador, beating goalkeeper Alexander Dominguez in the third minute of extra time to secure a 2-1 victory in the Group E opener June 15 in Brasilia, Brazil. Switzerland's halftime replacement, Admir Mehmedi, scores the equalizer against Ecuador. 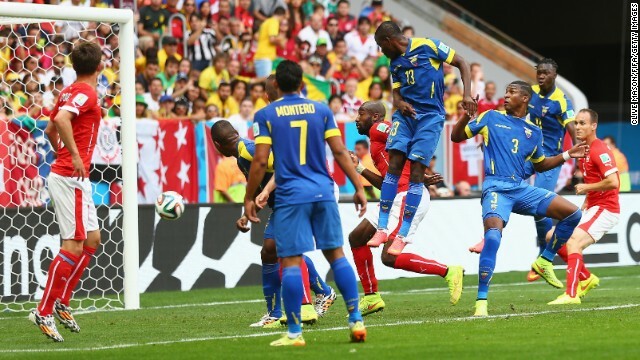 Enner Valencia's header puts Ecuador in front against Switzerland. 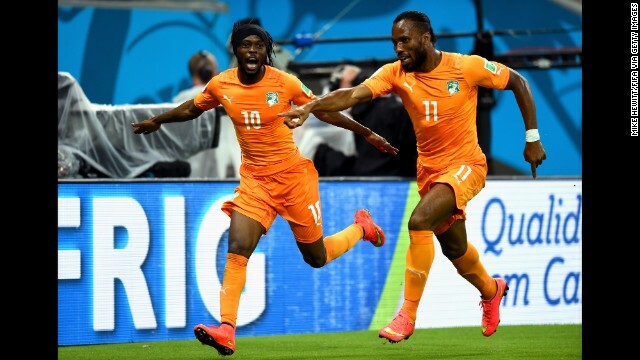 Gervinho, left, celebrates with Didier Drogba of the Ivory Coast after scoring the team's second goal in their World Cup match against Japan on Saturday, June 14. Ivory Coast trailed 1-0 at halftime but came back to win 2-1 in Recife, Brazil. 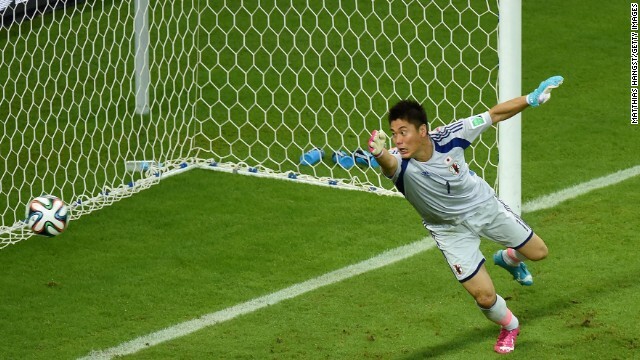 Japanese goalkeeper Eiji Kawashima tries in vain to stop a Wilfried Bony header from going in for Ivory Coast's first goal. Keisuke Honda, second from right, celebrates scoring Japan's first goal with teammates Yuto Nagatomo, Yuya Osako and Hotaru Yamaguchi. 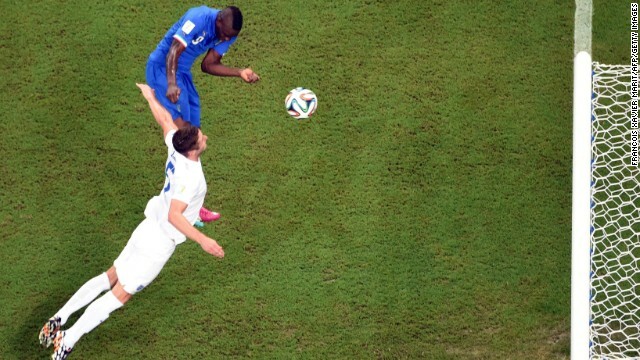 Italy striker Mario Balotelli, left, heads the winning goal against England on June 14. 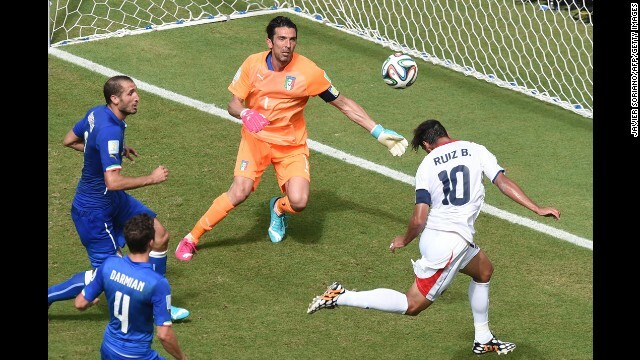 Italy defeated England 2-1 in Manaus, Brazil. 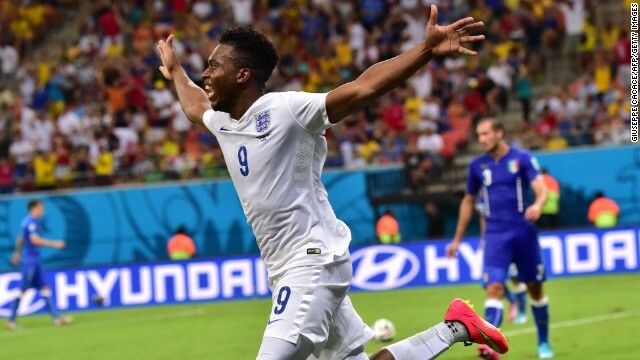 England forward Daniel Sturridge celebrates after scoring a first-half equalizer against Italy. 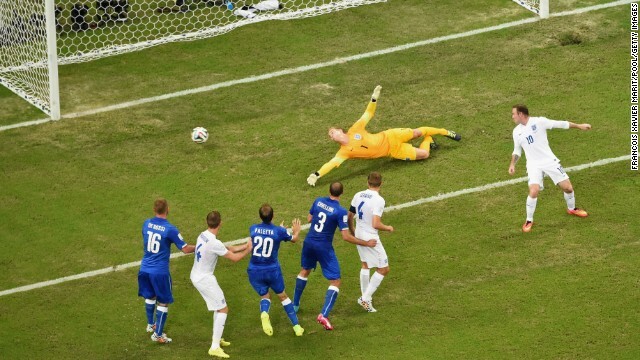 England goalkeeper Joe Hart dives as Claudio Marchisio's long-range shot gives Italy the lead. Uruguay goalkeeper Fernando Muslera, left, looks on as Costa Rica's players celebrate their team's late winner, scored by substitute Marco Urena, on June 14 in Fortaleza, Brazil. Costa Rica won 3-1. Oscar Duarte celebrates after scoring Costa Rica's second goal against Uruguay. 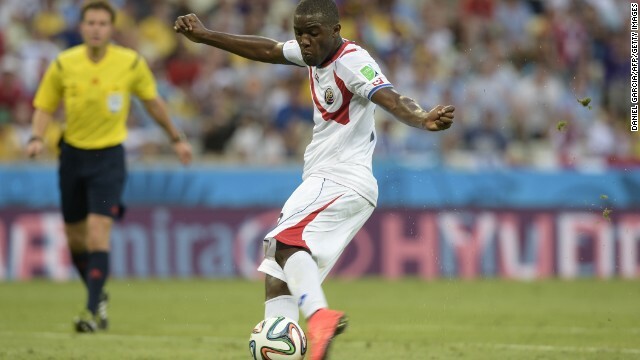 Forward Joel Campbell scores Costa Rica's equalizer against Uruguay. 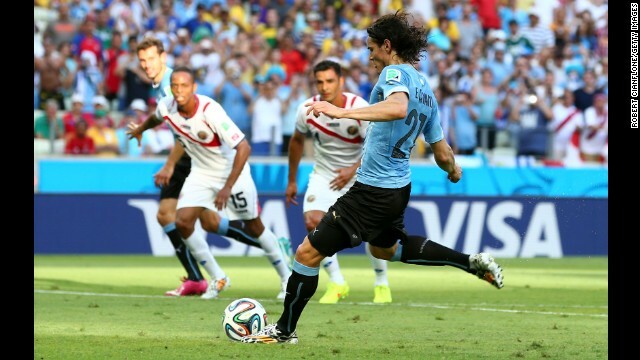 Edinson Cavani puts Uruguay ahead with a first-half penalty kick. Colombia midfielder James Rodriguez celebrates after scoring his team's third and final goal during a match against Greece on June 14 in Belo Horizonte, Brazil. Colombia won 3-0. 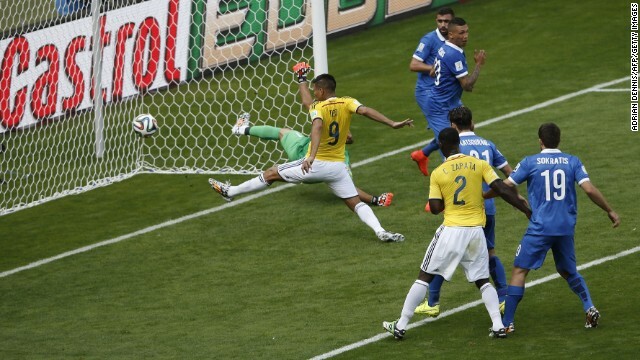 Colombia forward Teofilo Gutierrez scores the second goal. 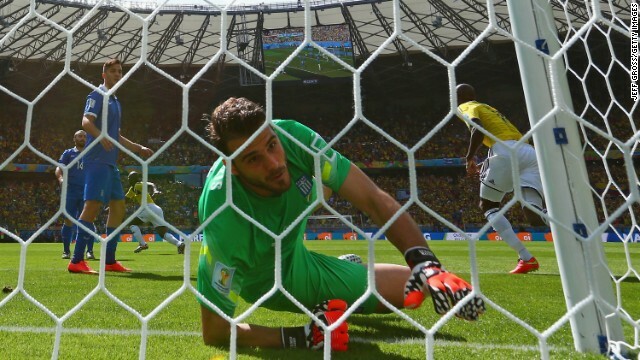 Greece goalkeeper Orestis Karnezis fails to keep out a deflected shot by Colombia's Pablo Armero in the fifth minute of the match. Jean Beausejour of Chile shoots and scores the final goal during his team's 3-1 win over Australia on Friday, June 13, in Cuiaba, Brazil. 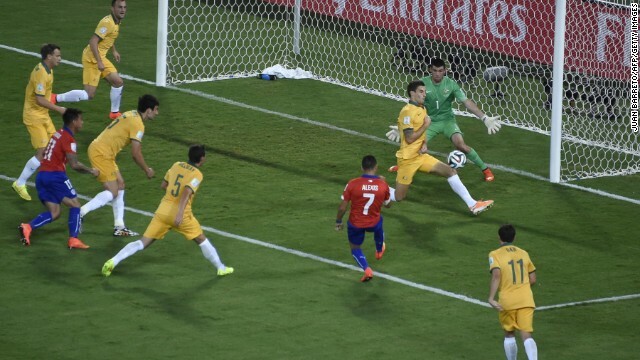 Australian forward Tim Cahill heads in a first-half goal to cut Chile's lead to one. Chile had a 2-0 lead at the time. 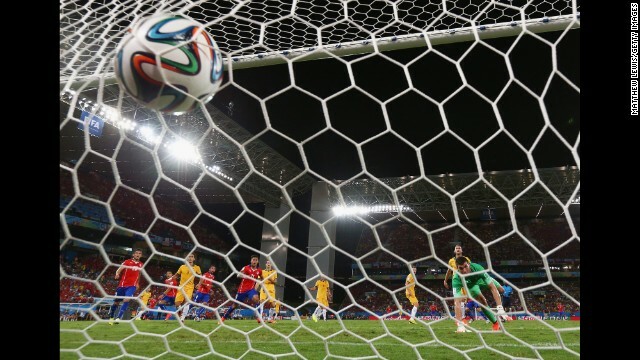 The ball bulges the back of the net after Chile's Jorge Valdivia scored in the 14th minute of the game. 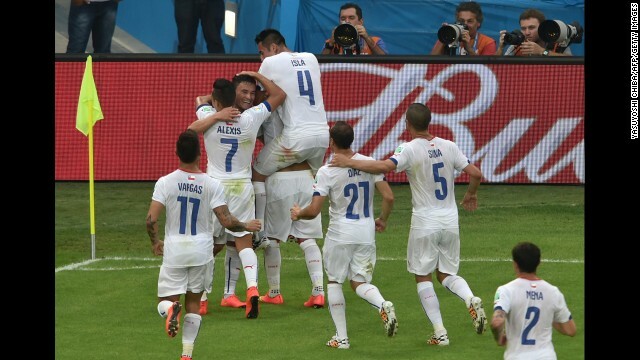 The goal came within two minutes of Chile's first goal. 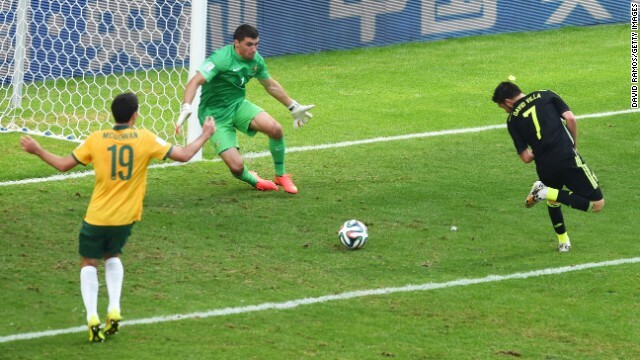 Chile forward Alexis Sanchez kicks the ball past two Australians to score the opening goal of the match. 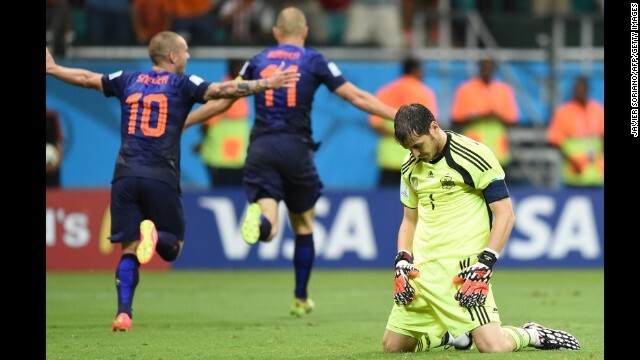 Spanish goalkeeper Iker Casillas, right, reacts after Dutch forward Arjen Robben, center, scored to put the finishing touches on a 5-1 win for the Netherlands on June 13. 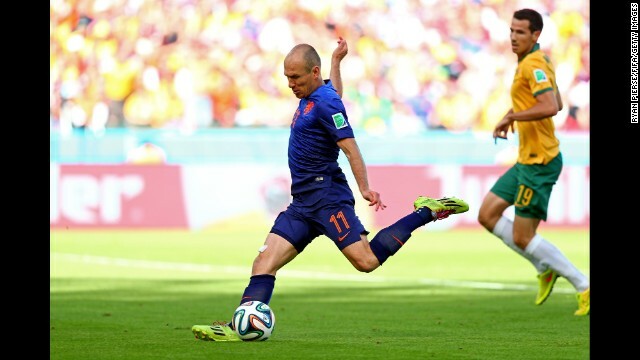 It was Robben's second goal of the match, which was played in Salvador, Brazil. Netherlands forward Robin van Persie, left, celebrates after scoring his second goal of the match to put the Dutch up 4-1. Stefan de Vrij, right, deflects the ball in for the Netherlands' third goal while van Persie collides with Spanish goalkeeper Iker Casillas. 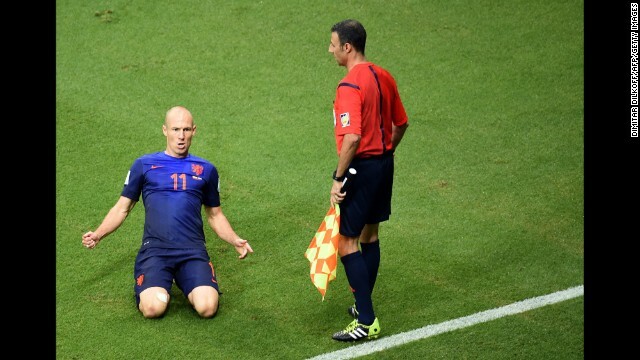 Robben slides on the ground after scoring his first goal. It gave the Dutch a 2-1 lead in the second half. 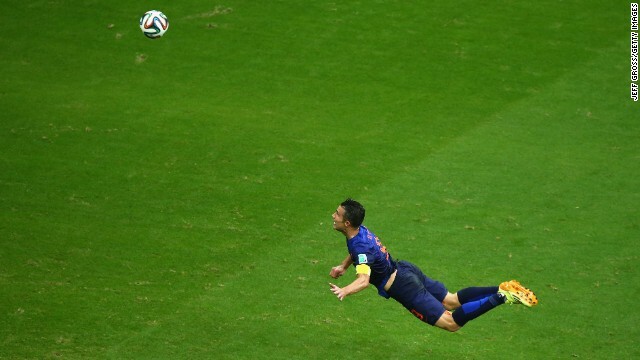 Van Persie scores a diving header in the first half of the match against Spain. It tied the score at 1-1. Xabi Alonso scores on a penalty kick to give Spain an early 1-0 lead. Oribe Peralta celebrates after scoring the only goal in Mexico's 1-0 win over Cameroon on June 13 in Natal, Brazil. 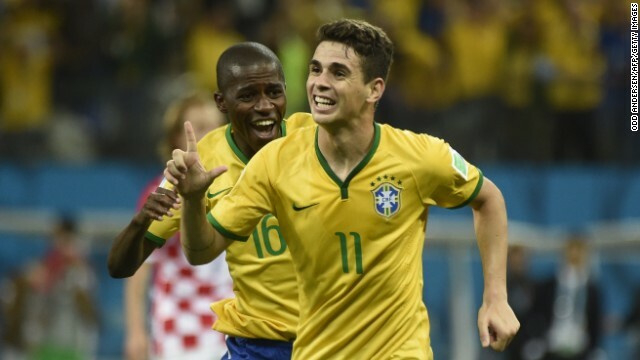 Brazilian midfielder Oscar, right, celebrates after scoring a late goal to give his team a 3-1 win over Croatia in the opening match of the World Cup on Thursday, June 12. 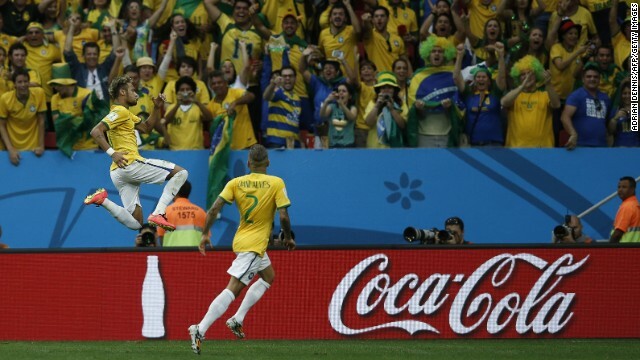 Neymar scores a penalty kick to give Brazil a 2-1 lead. It was Neymar's second goal of the match, which was played in Sao Paulo, Brazil. Croatian goalkeeper Stipe Pletikosa dives but fails to stop the ball as Neymar scores his first goal to tie the match at 1-1. 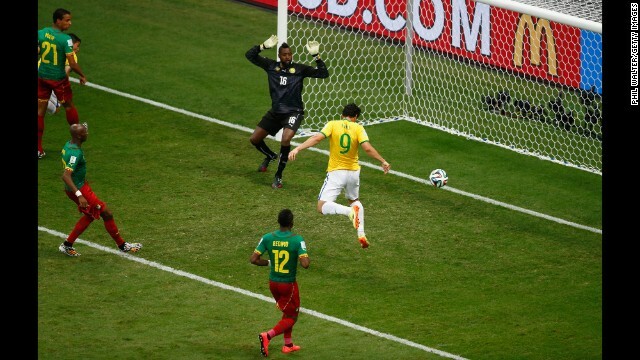 Brazil's Marcelo, second from right, accidentally deflects the ball past his own goalkeeper, Julio Cesar. 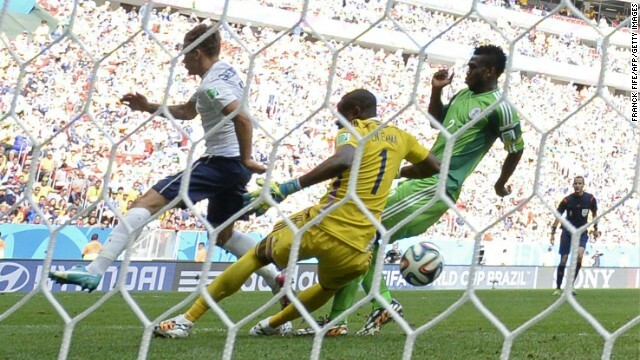 It was the first goal of the tournament, and it put the host country in an early hole. 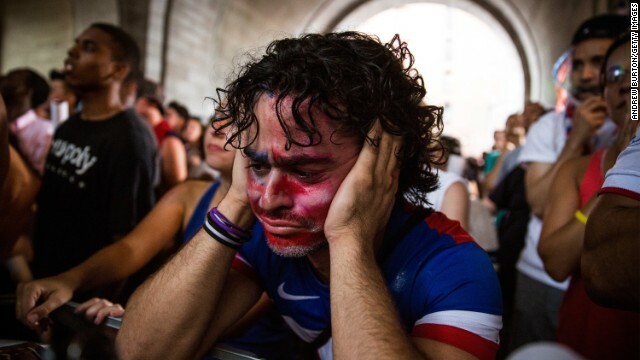 Christian Raja reacts while he and other people in New York watch the World Cup match between the United States and Belgium on Tuesday, July 1. 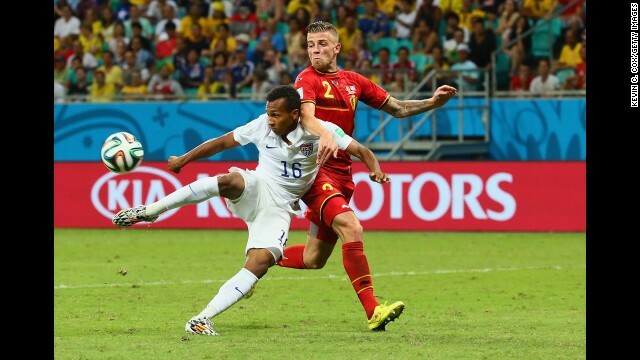 Belgium won 2-1 to knock the United States out of the soccer tournament in Brazil. 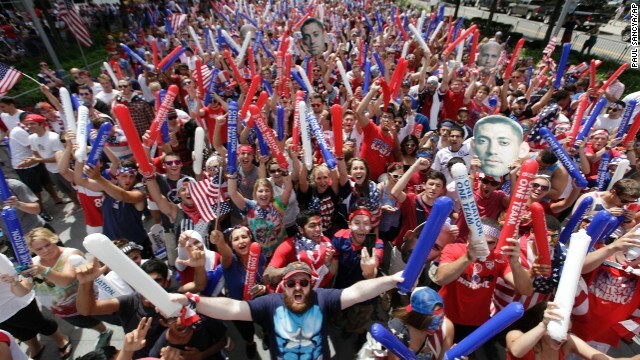 Fans gather at Chicago's Soldier Field to watch the U.S.-Belgium match. 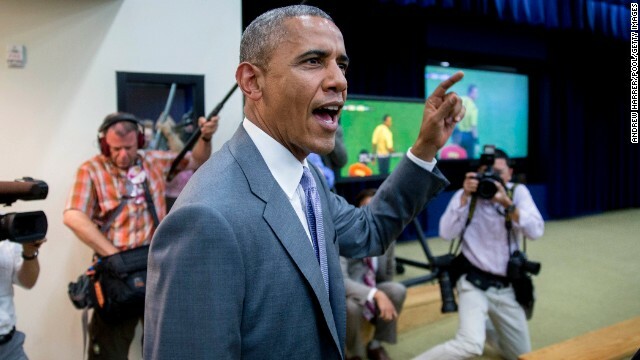 U.S. President Barack Obama chants "I believe that we will win" as he arrives at the Eisenhower Executive Office Building in Washington to watch the Belgium match. 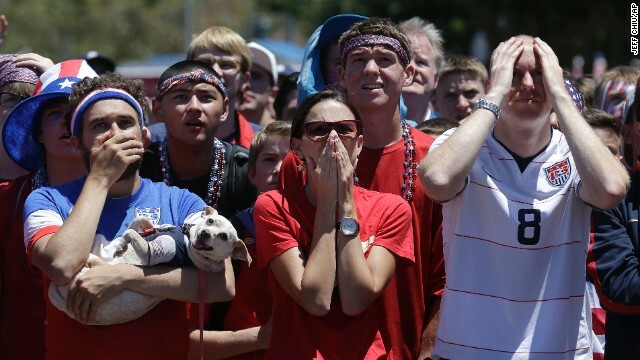 Fans in San Francisco react as they watch the Belgium match. U.S. fans in Atlanta watch the Belgium match. 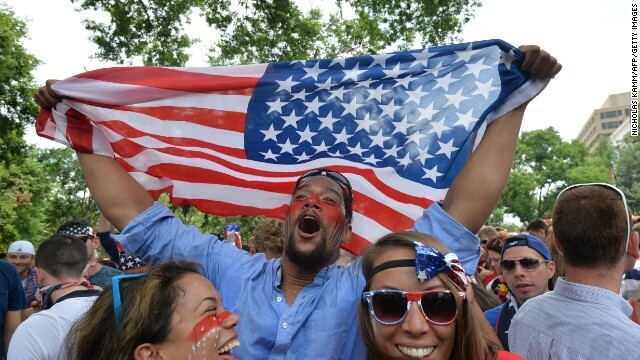 U.S. fans cheer at a public viewing party in Detroit. 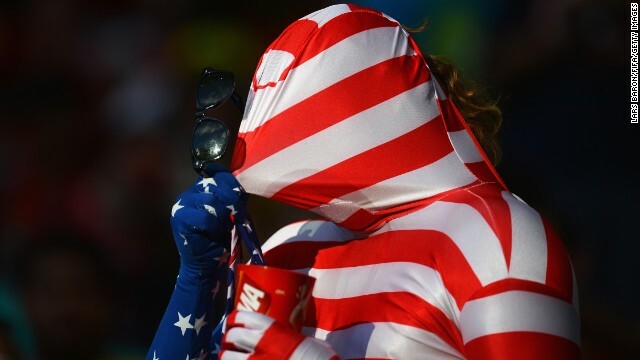 A U.S. fan soaks up the atmosphere in Salvador, Brazil, prior to the Belgium match. 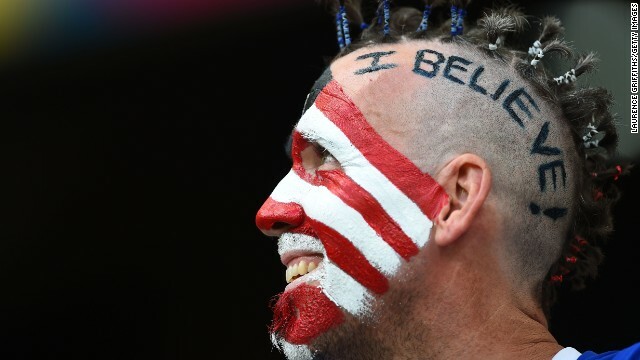 A U.S. fan is seen in Salvador on July 1. 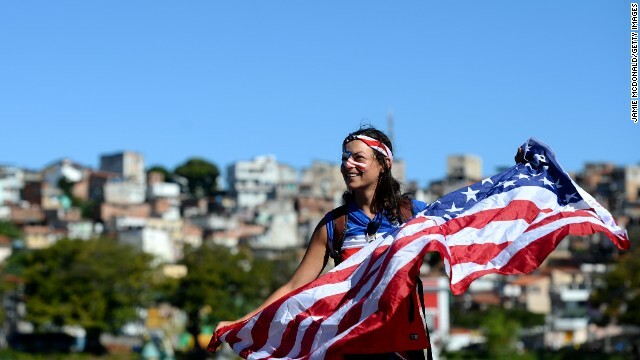 A U.S. fan in Salvador holds her flag ahead of the match on July 1. 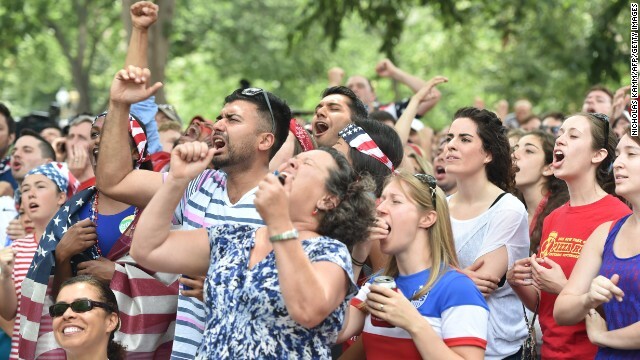 Fans celebrate from Dupont Circle in Washington on Thursday, June 26, after learning that the United States team, despite losing to Germany, advanced to the Round of 16 in the World Cup. Fans in Chicago's Grant Park celebrate June 26 after learning that the U.S. team would advance to the next round of the World Cup. 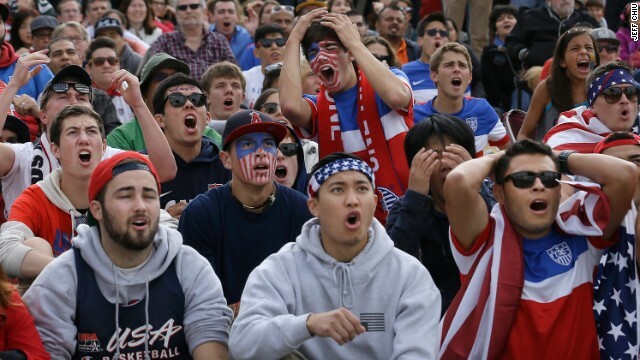 U.S. fans react while watching the United States-Germany match in San Francisco on June 26. 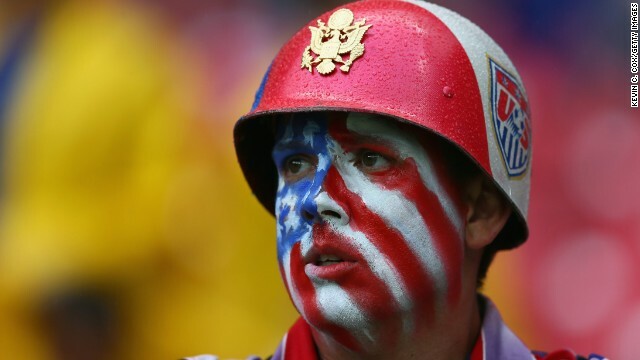 A fan looks on in the rain during the World Cup match between the United States and Germany in Recife, Brazil. 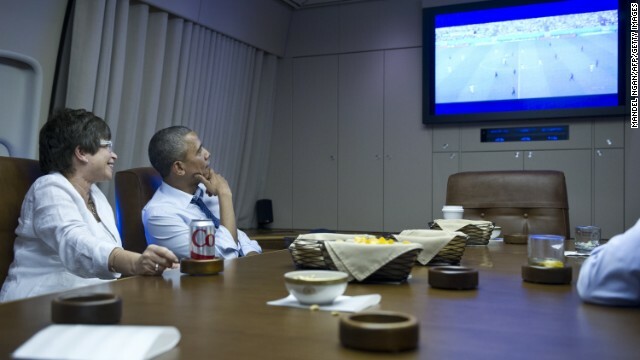 U.S. President Barack Obama and senior adviser Valerie Jarrett watch the Germany match while en route to Minneapolis. 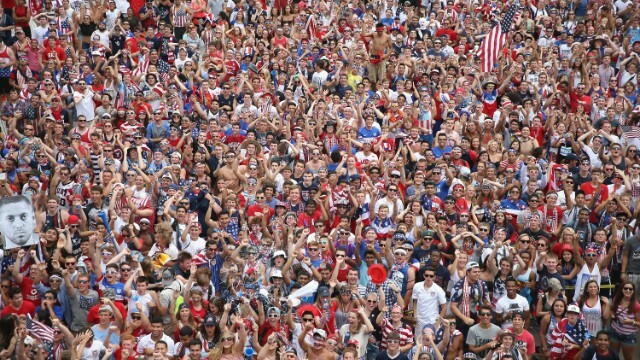 U.S. fans cheer during the Germany match. 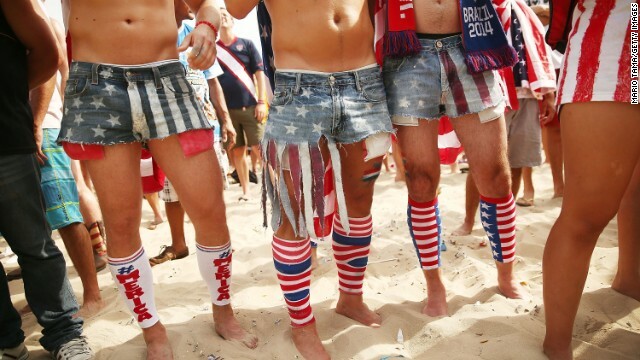 U.S. fans are seen at Pernambuco Arena in Recife. 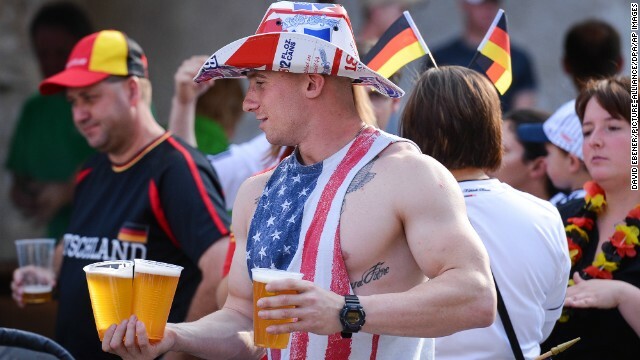 A member of the U.S. Army watches the Germany game at Dagestein Castle, which is near the Army Training Area Grafenwoehr in Vilseck, Germany. Kelsey Neylon watches the United States play Germany on a giant screen at Chicago's Grant Park. 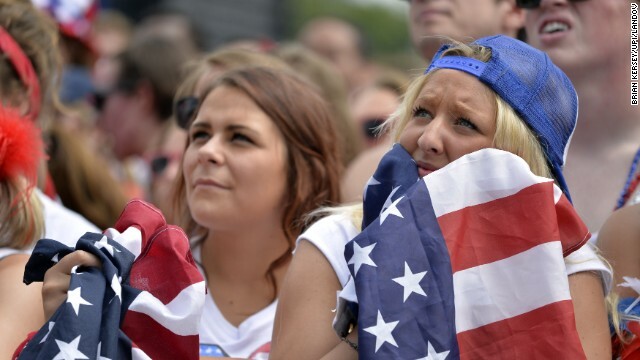 U.S. supporters watch the Germany game at a FIFA Fan Fest in Rio de Janeiro. Fans watch the Germany match from Dupont Circle in Washington. A fan looks on in the rain at Arena Pernambuco. Origi again gave notice of his menace by glancing a header from a Toby Alderweireld cross onto the crossbar with Howard reduced to the role of spectator. Despite being pinned inside its own half for long spells, the United States remained a threat on the counter attack, and from one such downfield break Graham Zusi was inches away from connecting with a volley. Dempsey also tested Courtois with two attempts from range but in the main, the red wave continued. 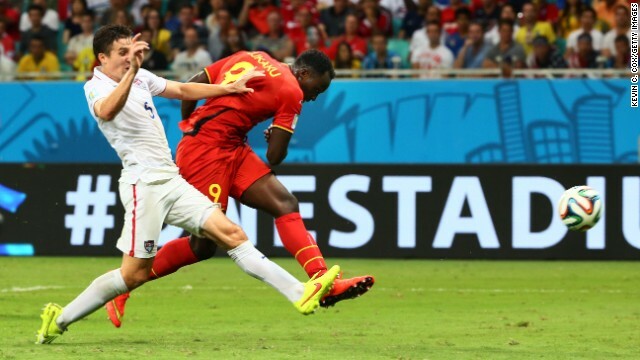 Kevin Mirallas was the next man to try and pierce USA's rearguard as he sauntered into the area -- defenders in white petrified of upending him -- before the ball ran loose to Origi. Yet again, Howard earned his stripes and made the block. The goalkeeper, a long standing servant of English club Everton, had USA fans in raptures again moments later as he diverted another goalbound effort from club colleague Mirallas after he had sprung the offside trap. Origi stung Howard's palms with a rifled shot from outside the box before Hazard rippled the side-netting as the pressure intensified with the end of normal time in sight. A measure of the attacking swarm Belgium had adopted came with the sight of captain Vincent Kompany picking the ball up in his own area and charging upfield to prompt Howard into another save, as his flick lurched for the bottom corner. 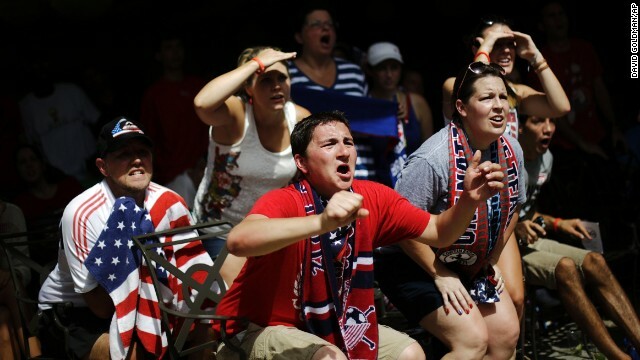 Deep in stoppage time, the moment the United States had been waiting for arrived. A knockdown inside the area found substitute Chris Wondolowski eight yards out with only the goalkeeper to beat. 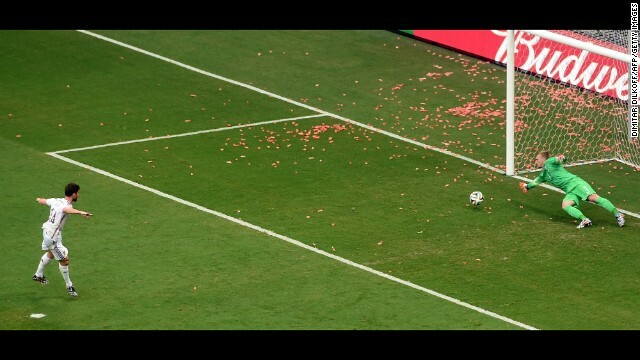 A nation held its breath and then howled as he launched the ball over the crossbar. An incorrect offside flag from the linesman spared his blushes, as the crowd in Salvador roared their approval at the conclusion of 90 minutes. For those recently converted to the joy of soccer it surely proved how thrilling a scoreless draw can be, but the deadlock was broken a matter of minutes into the added 30-minute period. De Bruyne played the role of destroyer, dancing away from three white shirts inside the area before angling a shot beyond the seemingly unimpeachable Howard. When substitute Romelu Lukaku added a second 12 minutes later it appeared as if the game was up. But if anything, the Chelsea striker's goal only served to inspire Klinsmann's troops. Chasing a lifeline, their game plan went out of the window, an all-out approach paying dividends when teenager Green -- a controversial pre-tournament selection in place of U.S. legend Landon Donovan -- volleyed home superbly to halve the deficit. From that point on, all hell broke loose. The Americans were nearly level within seconds of Green's strike as Jones hooked a shot that dropped tortuously wide of the far post. 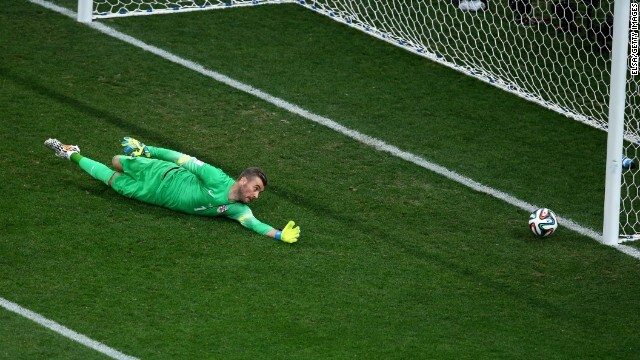 Then Lukaku squandered a chance to seal the tie once and for all, as Howard made his 14th save of the night -- the most in any World Cup match since 1966. The final act of a game that will live long in the memory saw a neatly worked free kick send captain Dempsey in on goal but when it mattered most, Courtois stood tall to make the block and repel the last effort the USA could muster.